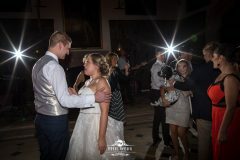 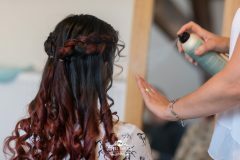 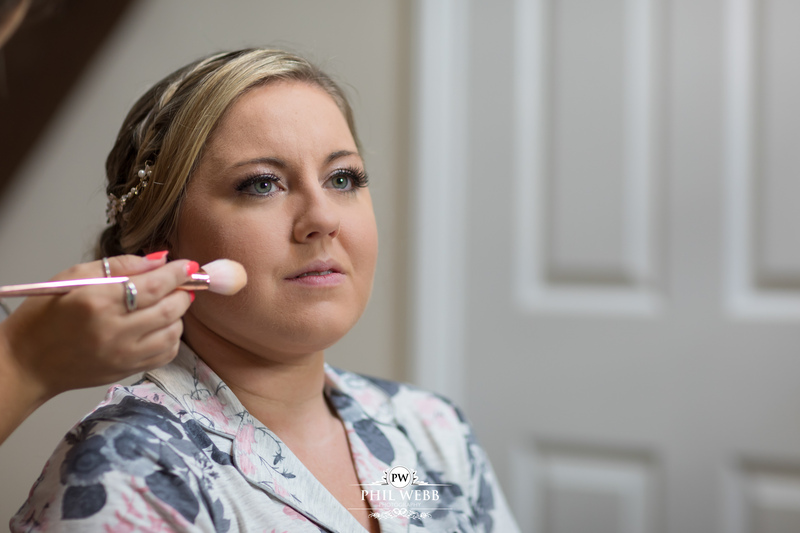 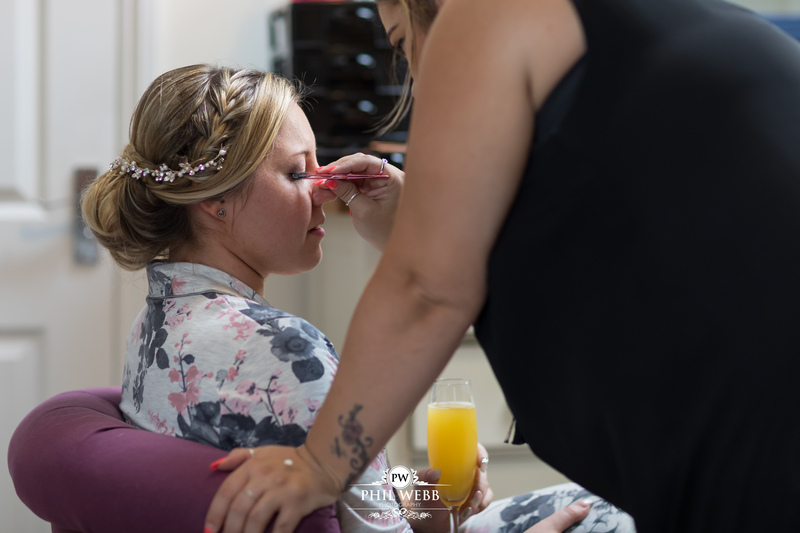 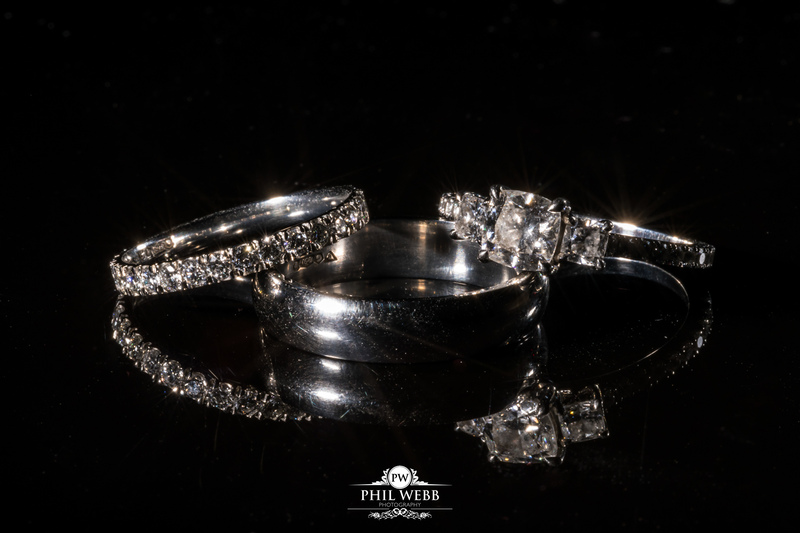 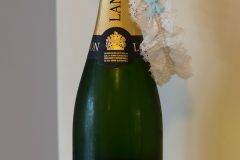 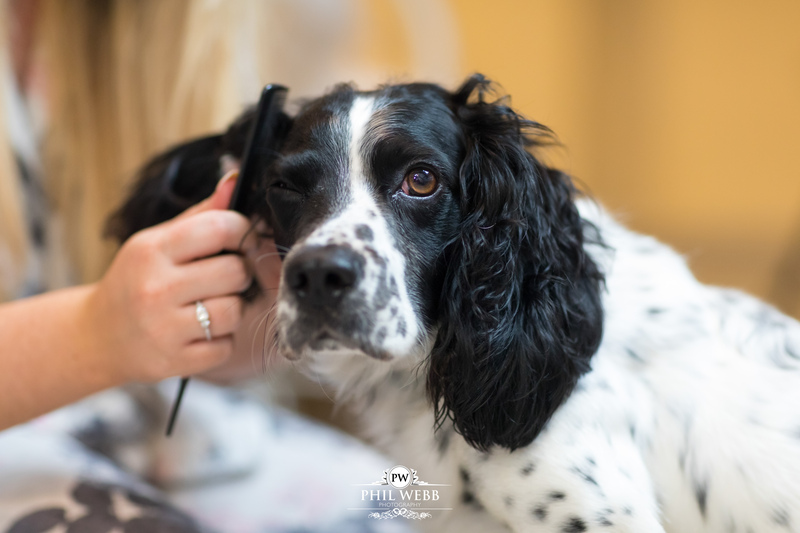 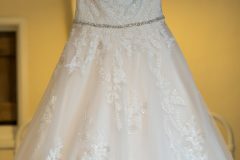 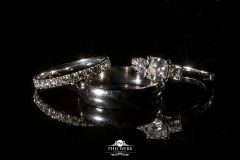 I first met Claire and her family at Cheltenham Racecourse wedding event. 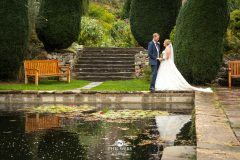 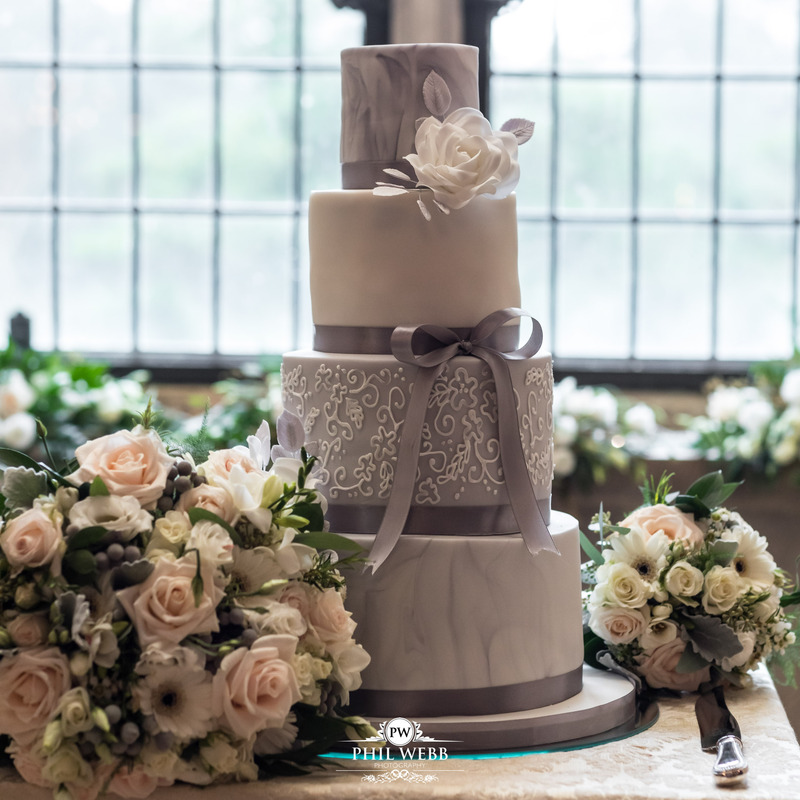 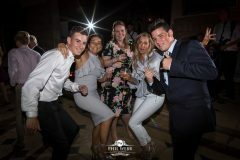 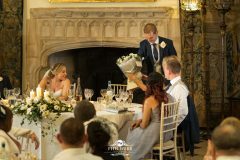 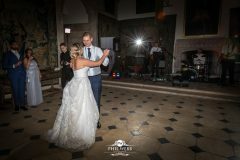 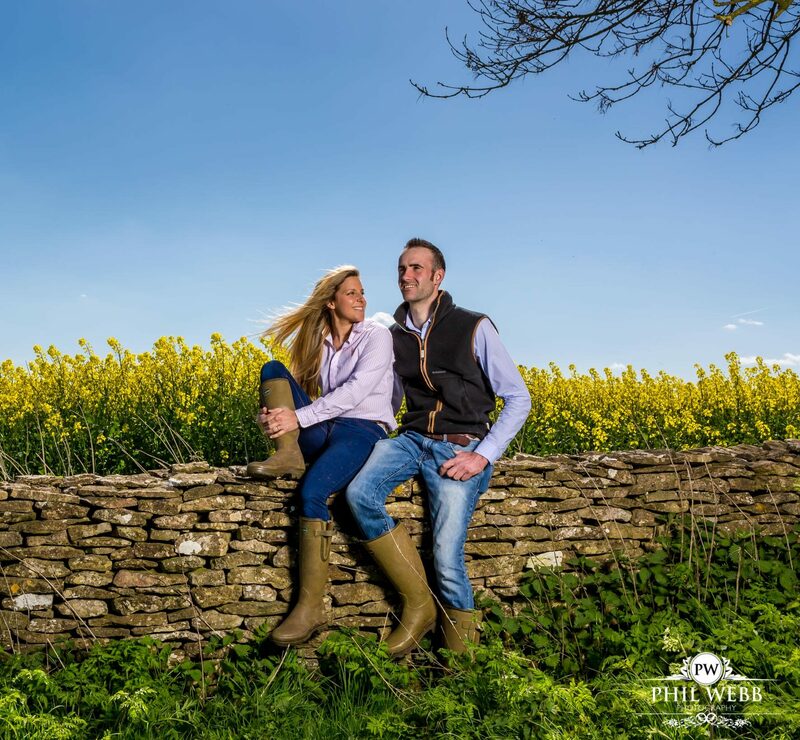 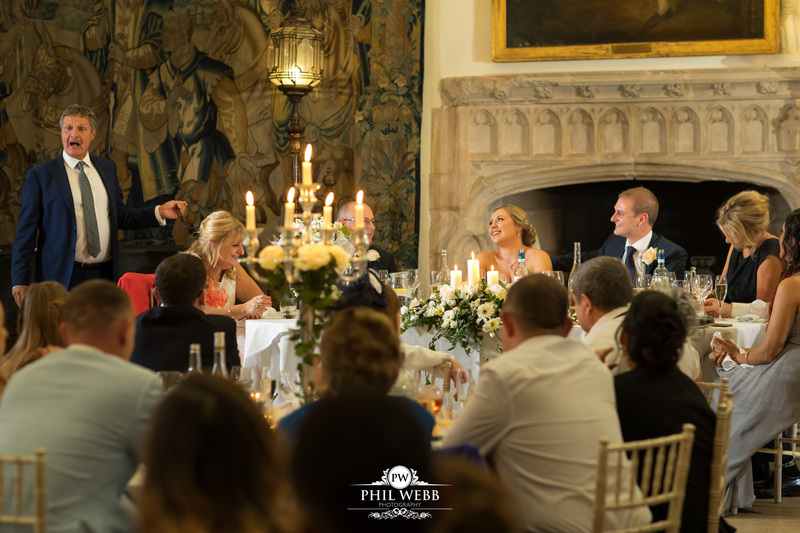 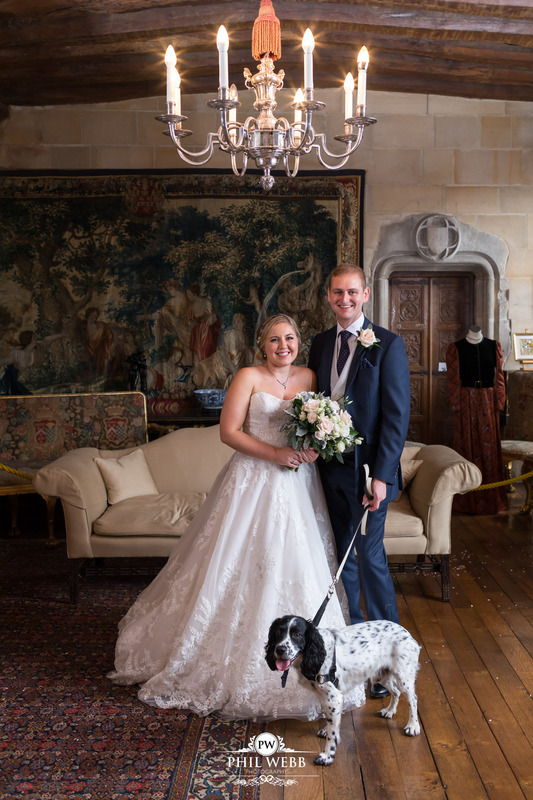 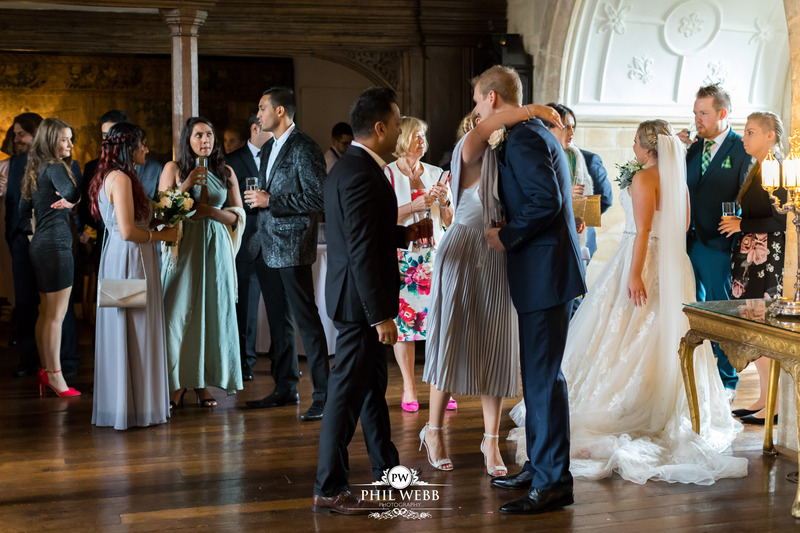 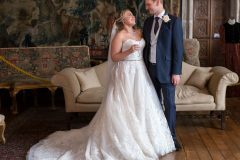 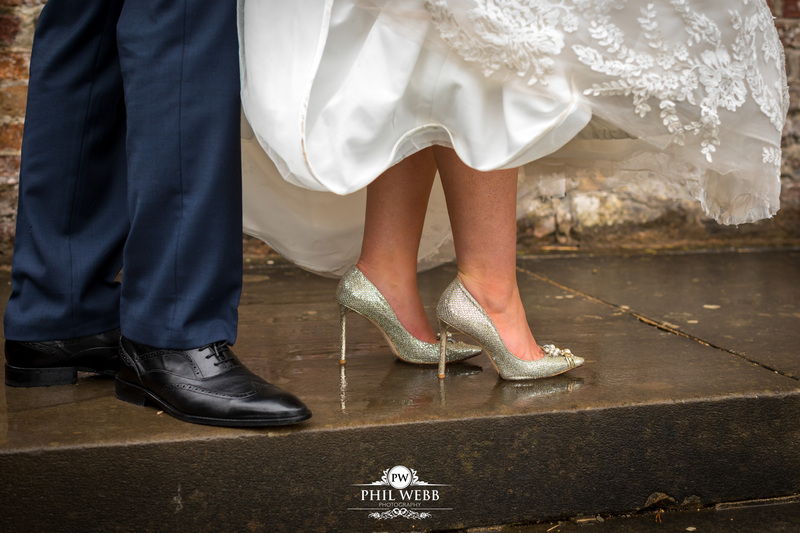 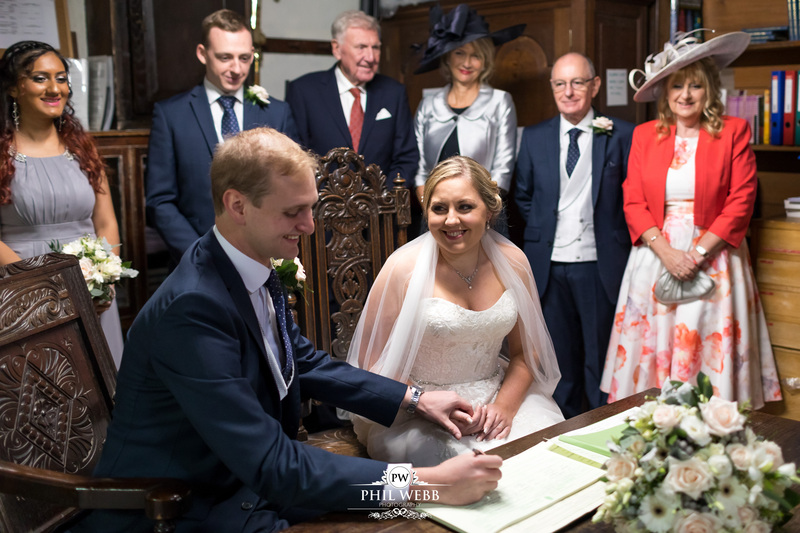 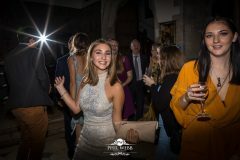 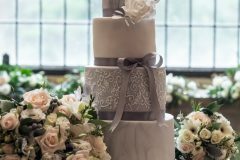 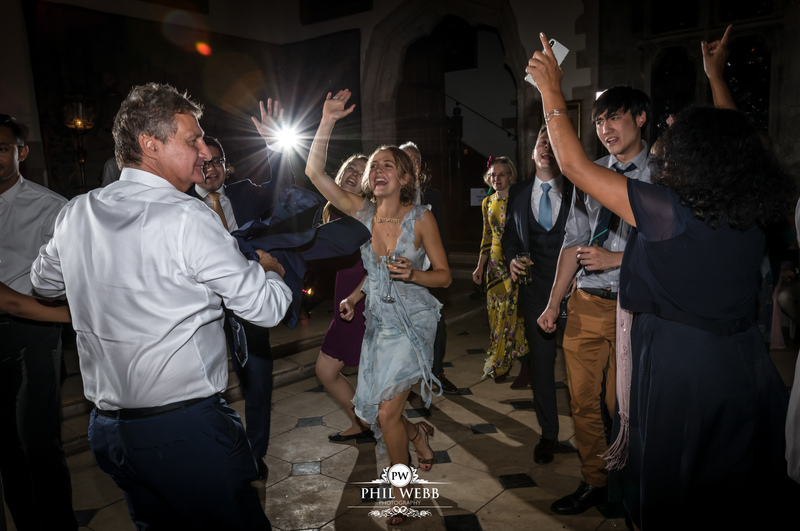 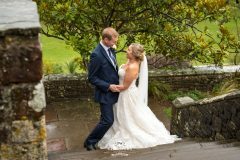 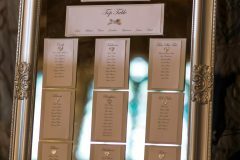 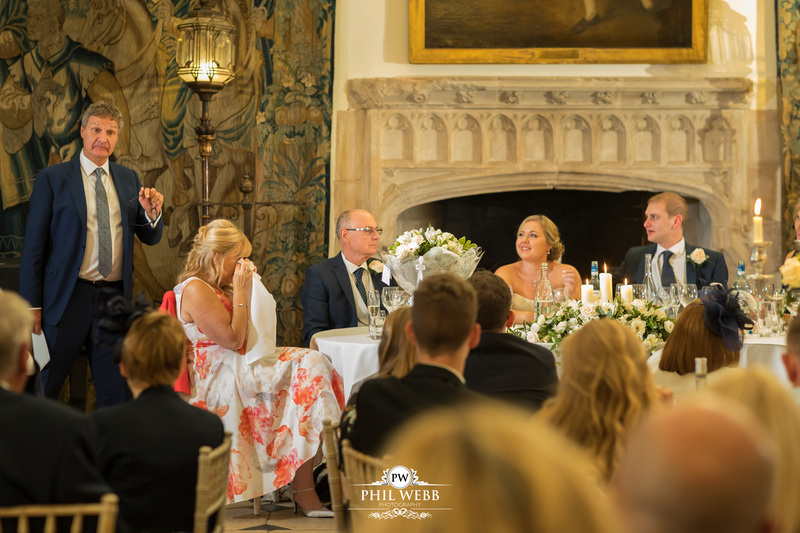 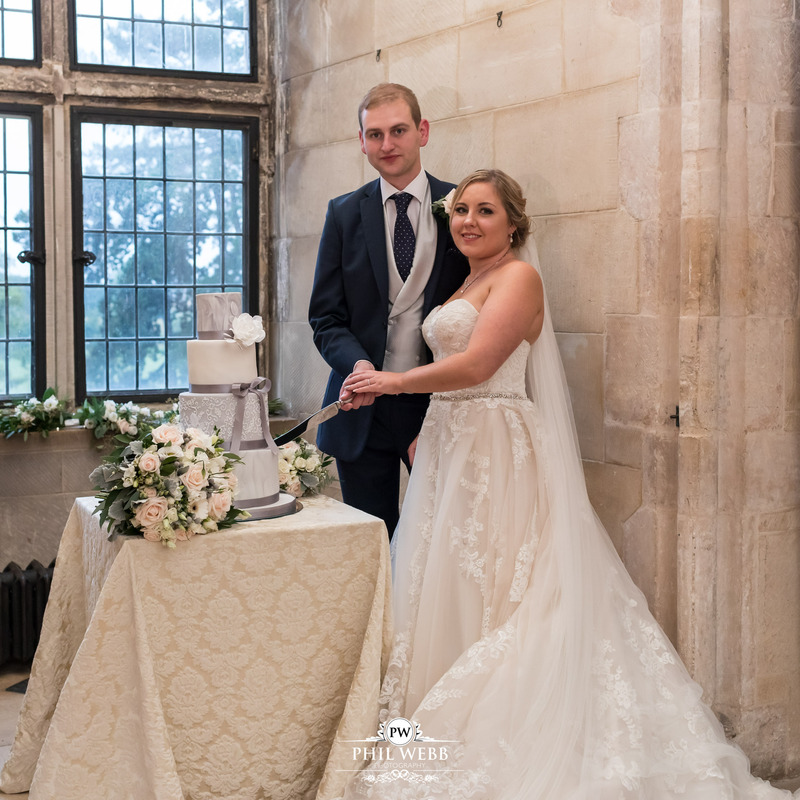 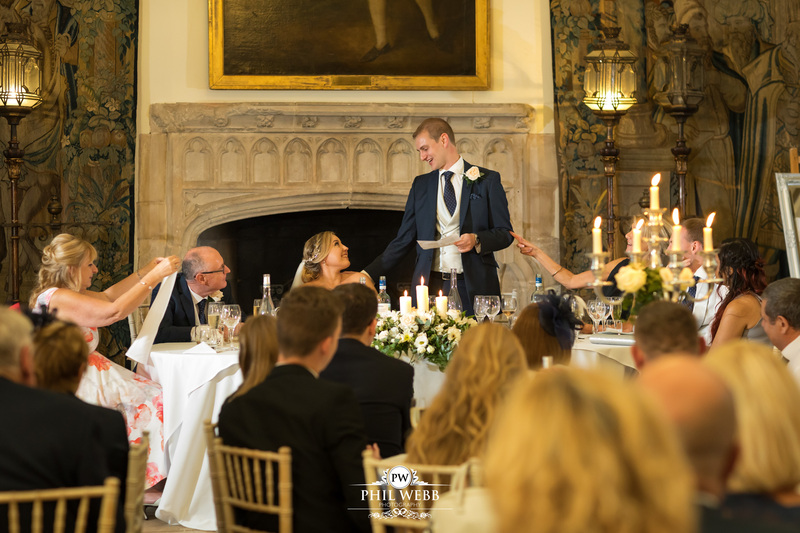 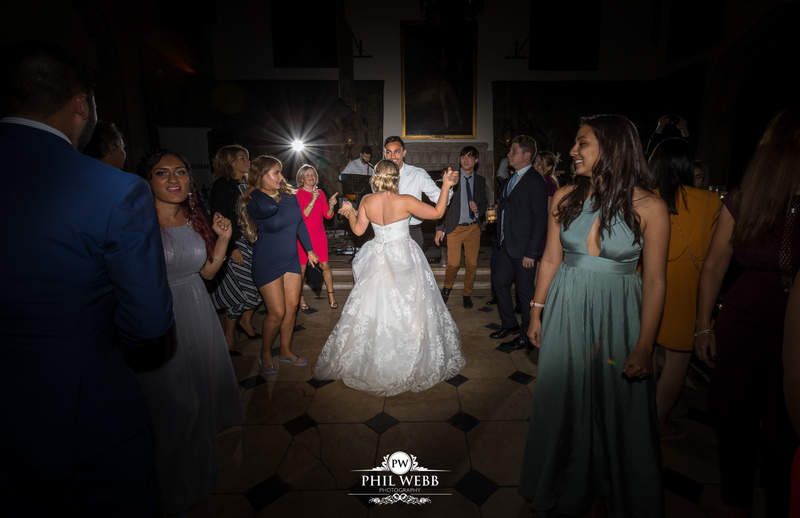 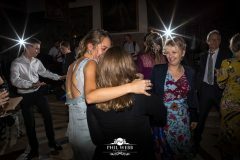 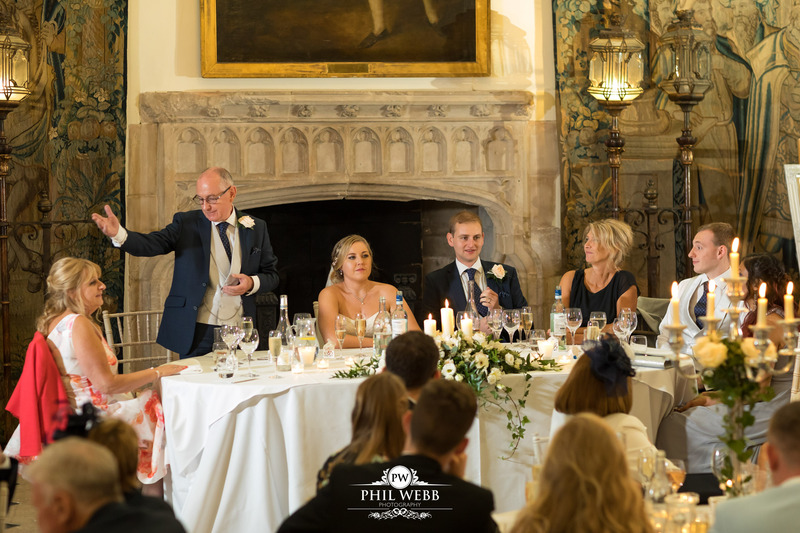 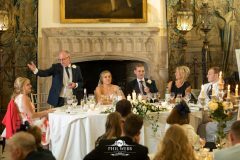 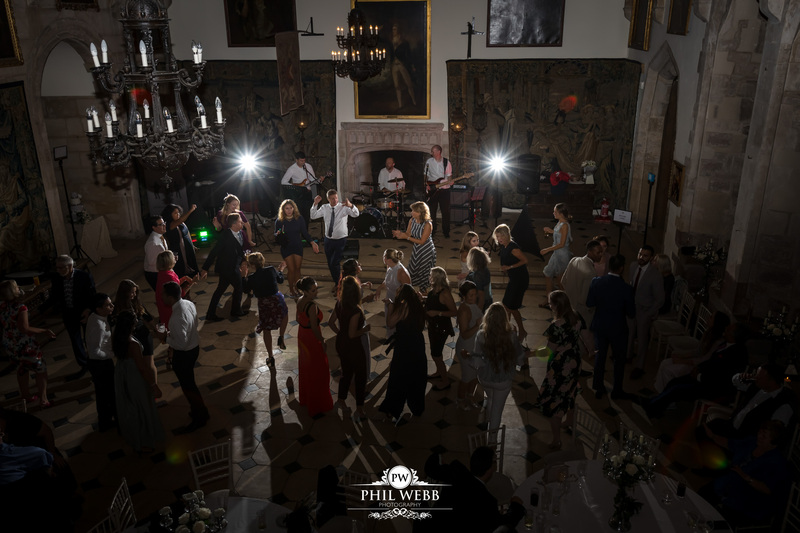 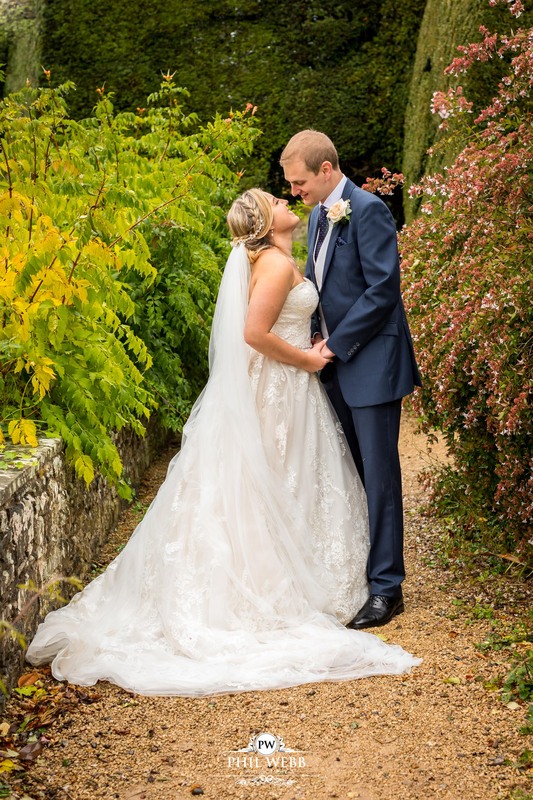 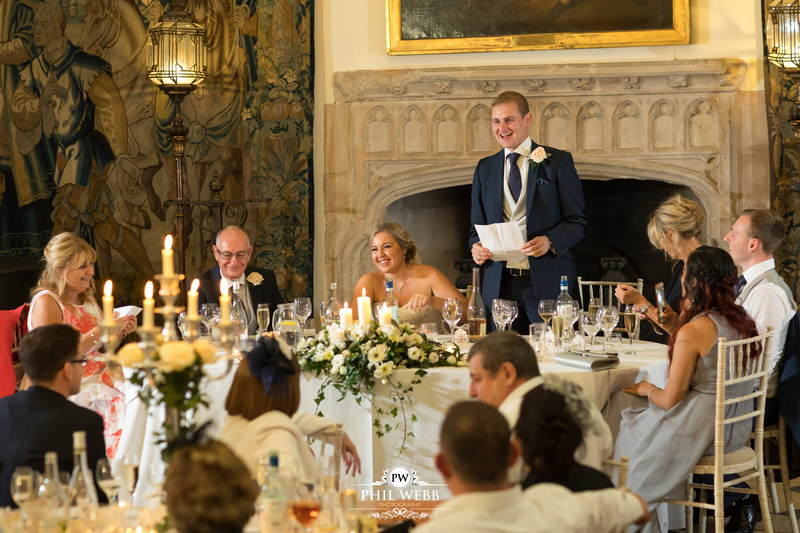 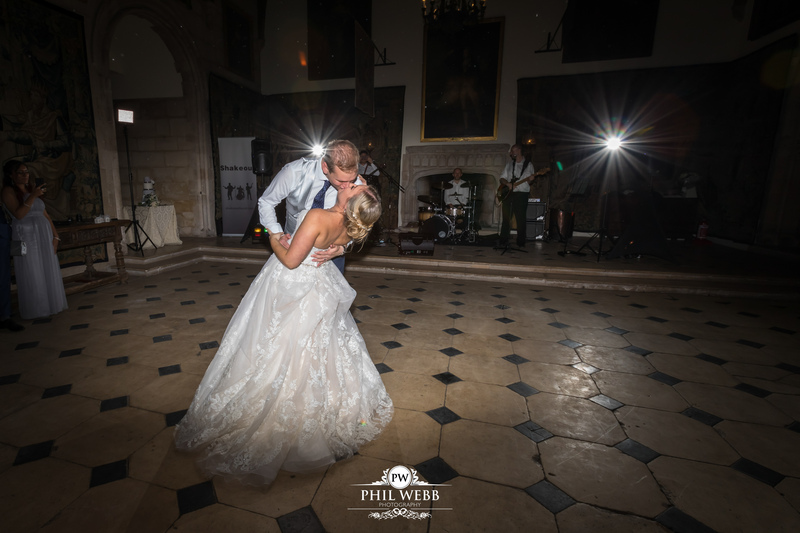 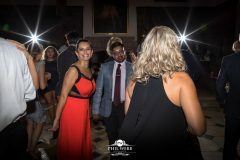 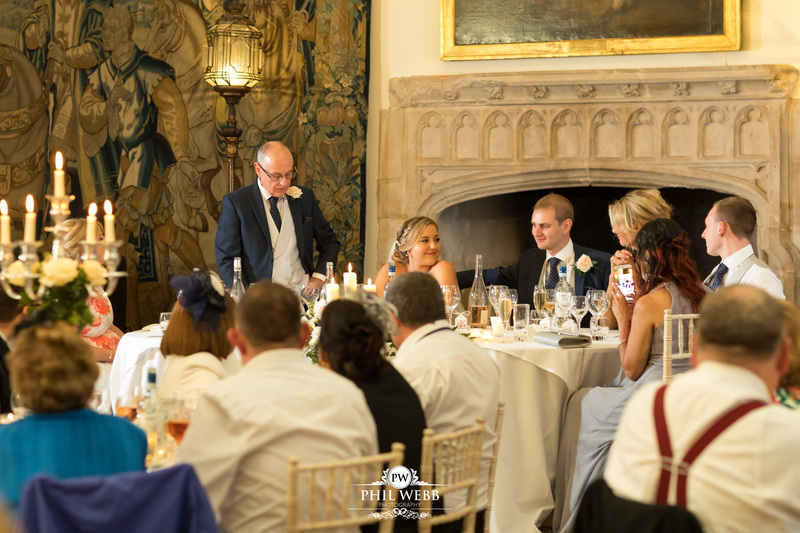 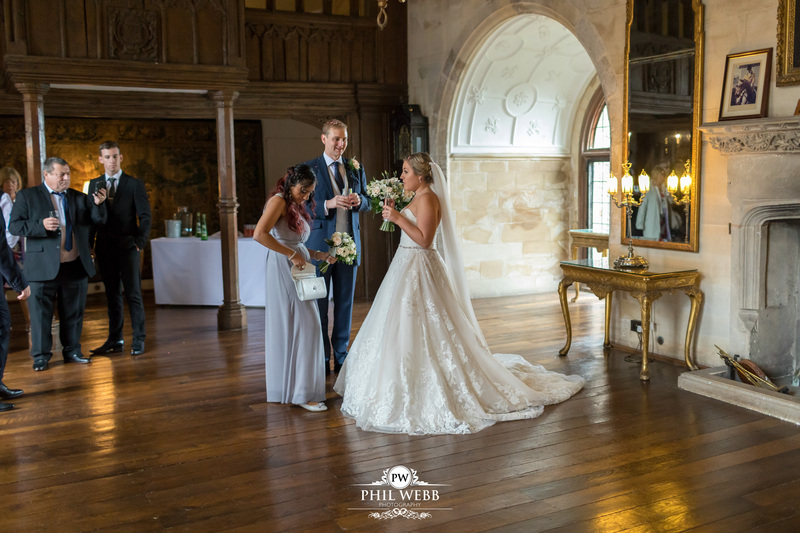 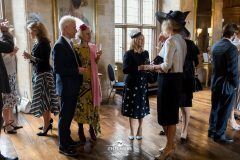 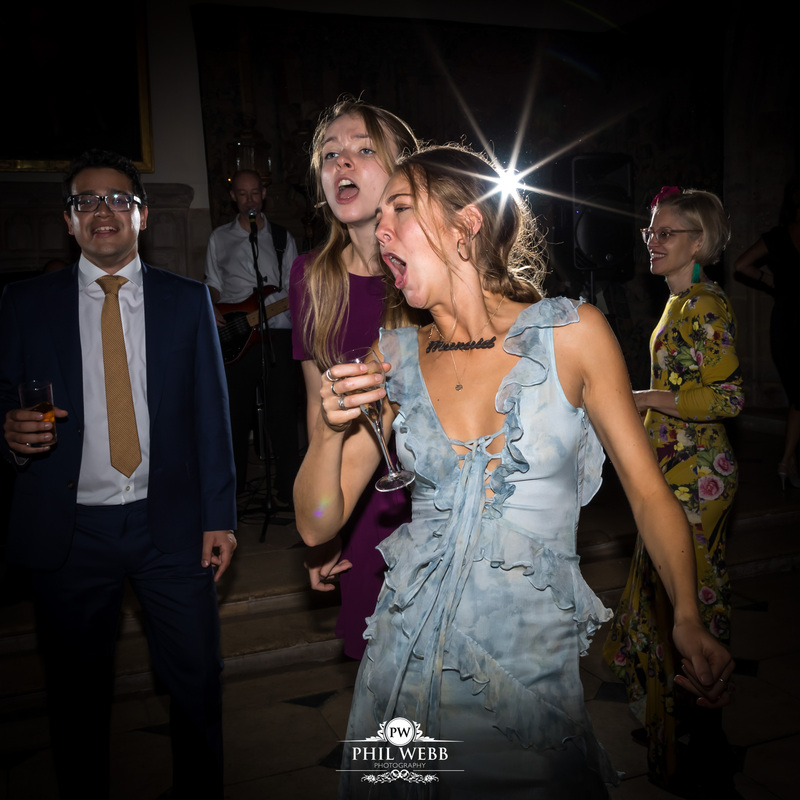 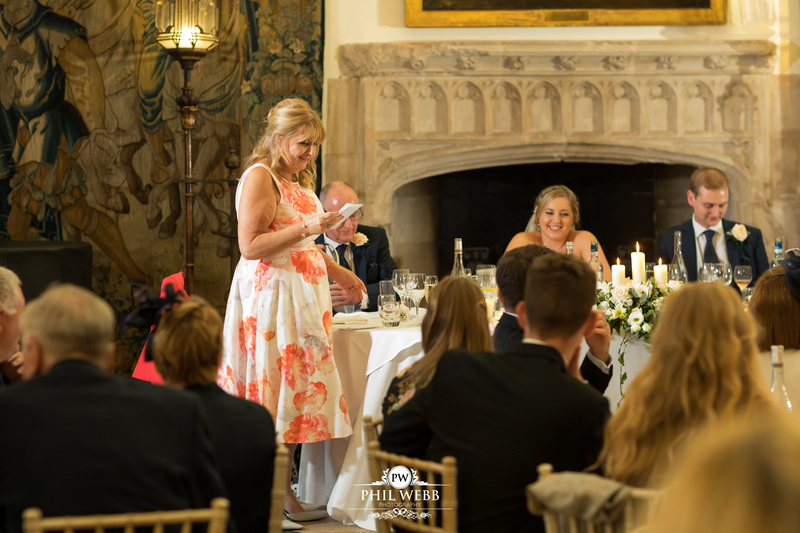 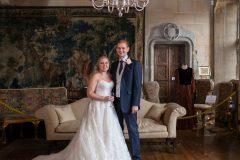 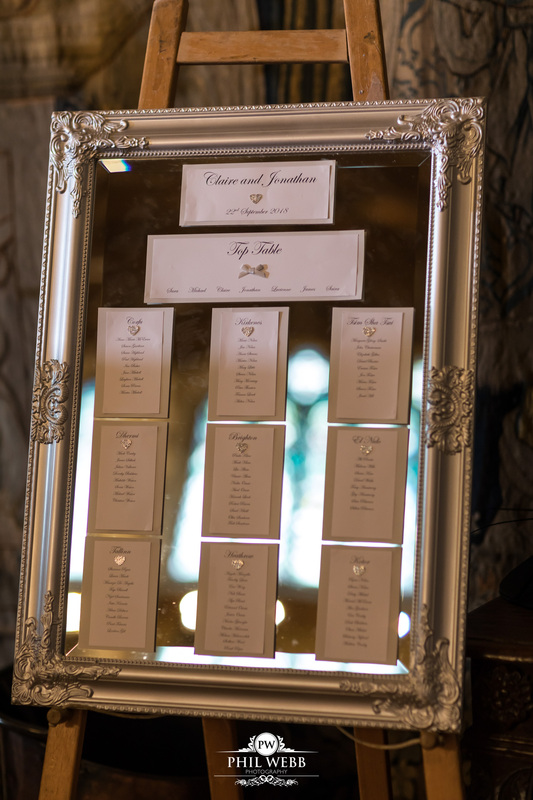 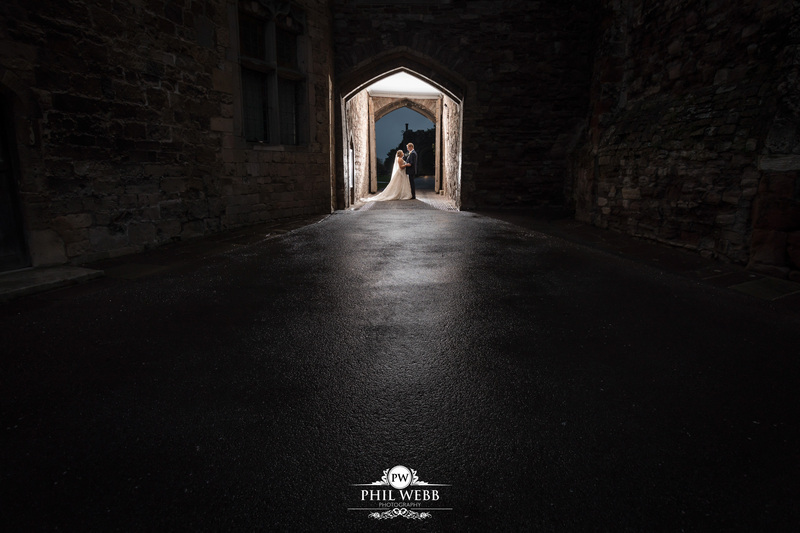 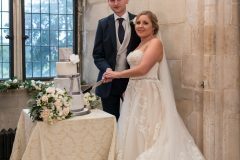 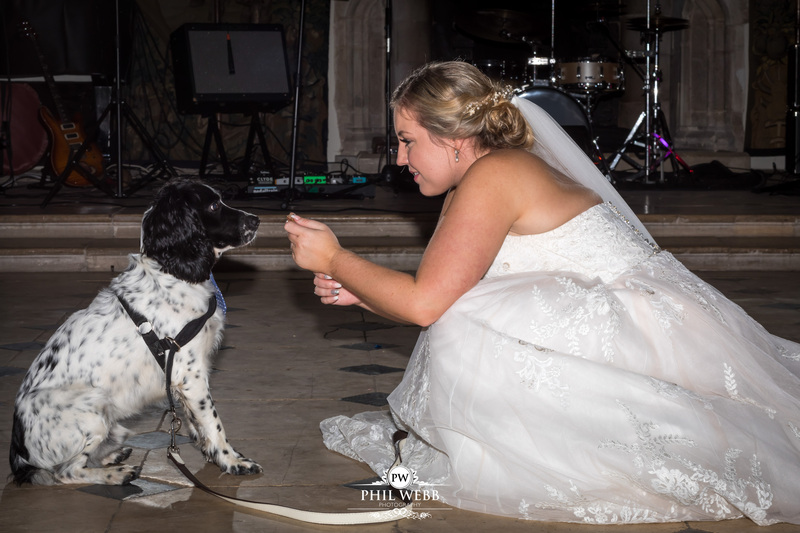 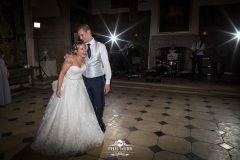 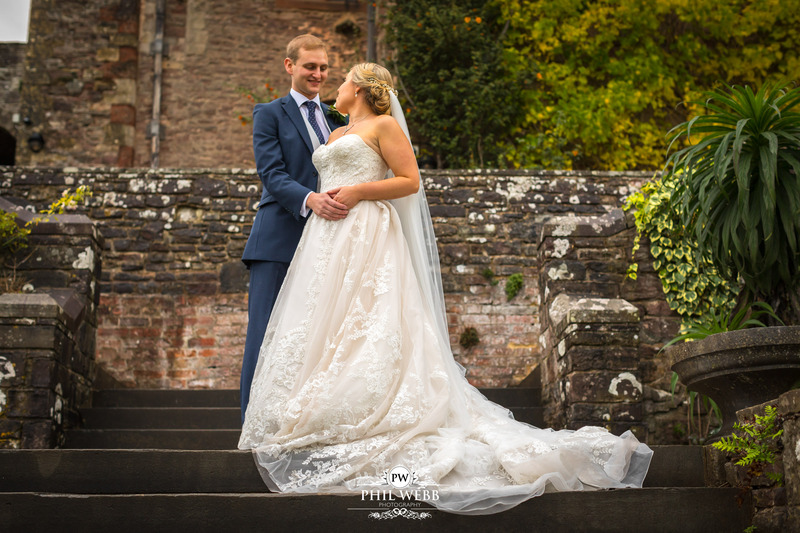 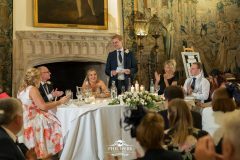 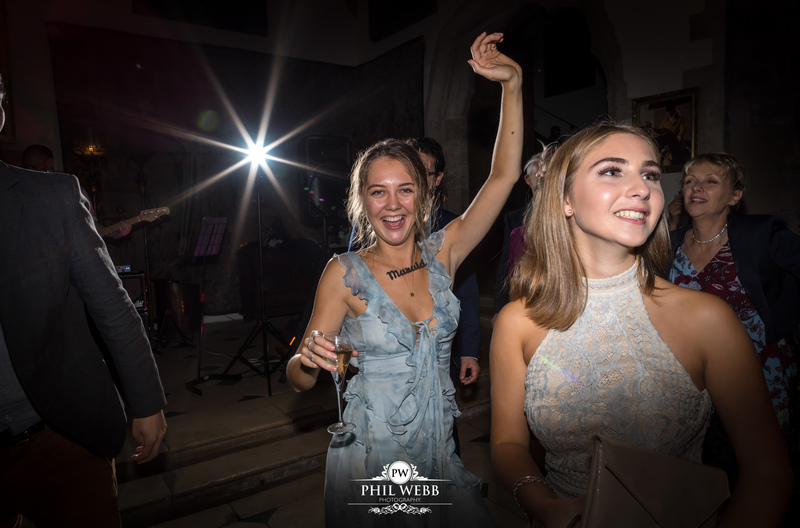 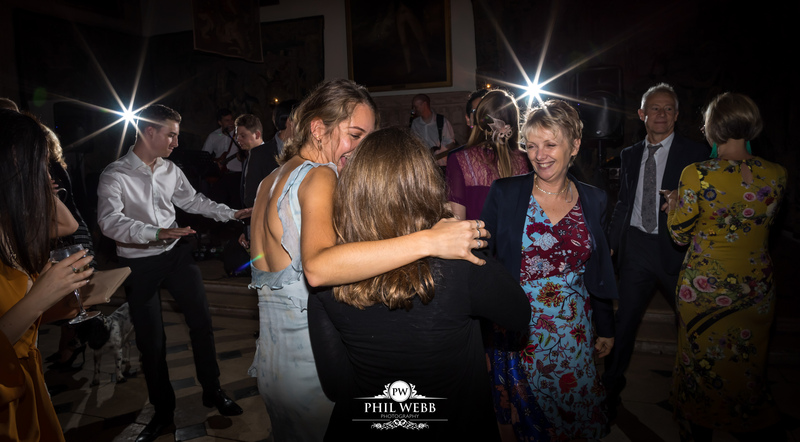 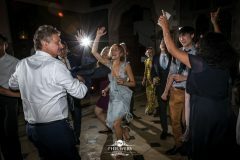 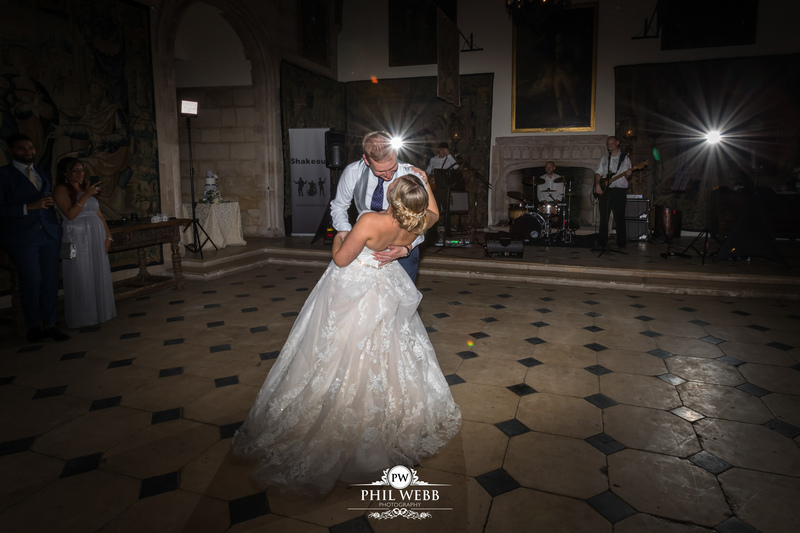 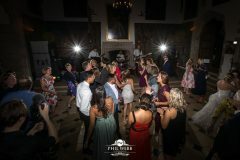 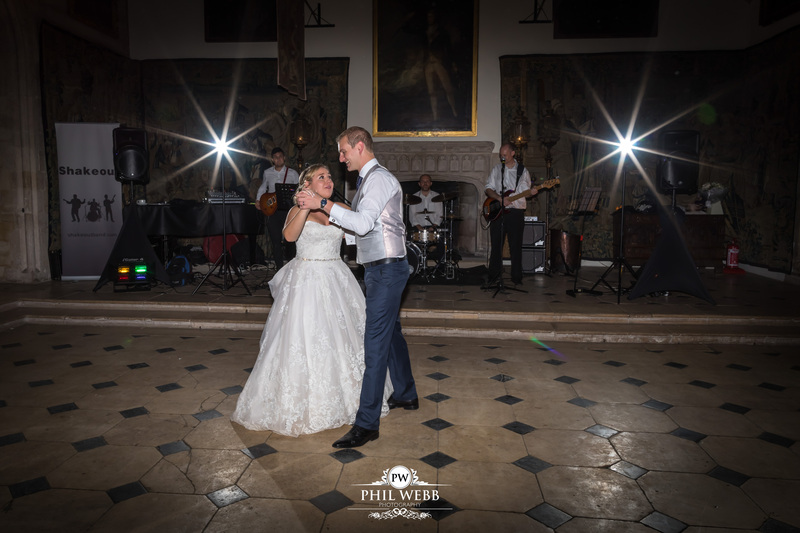 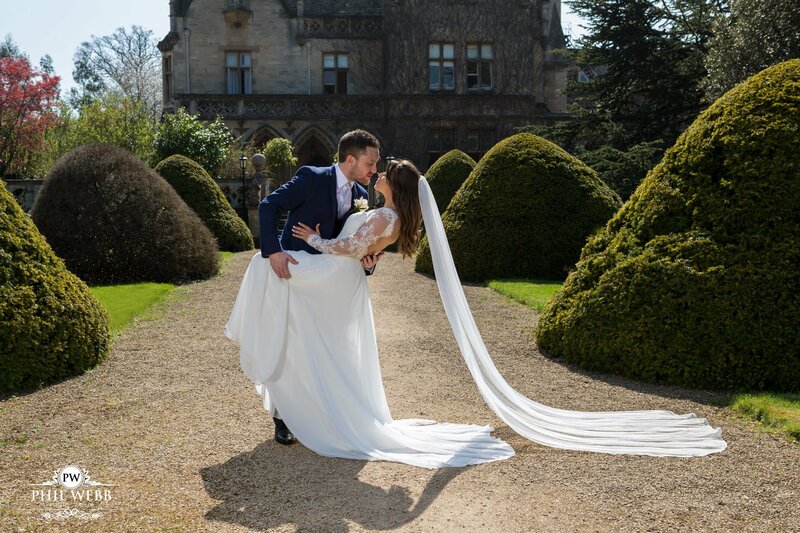 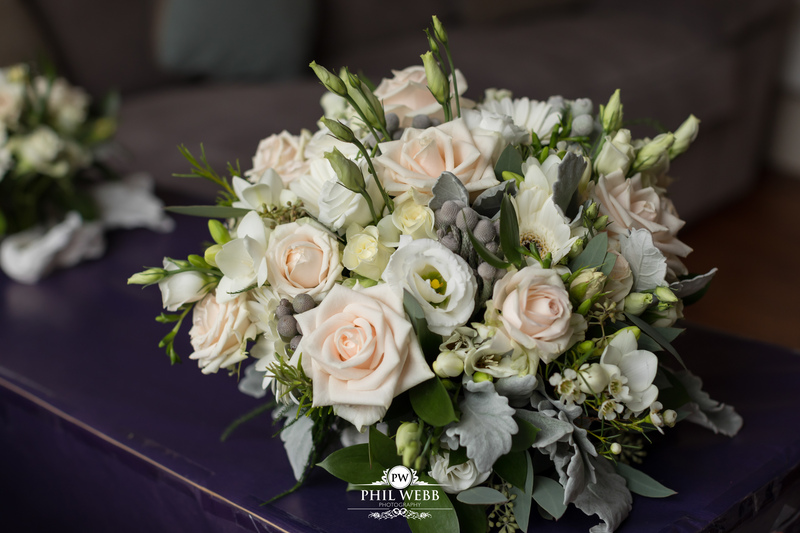 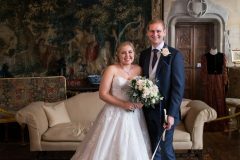 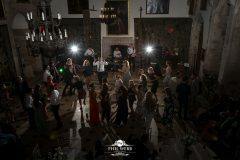 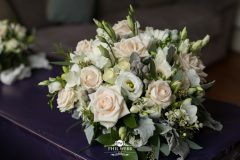 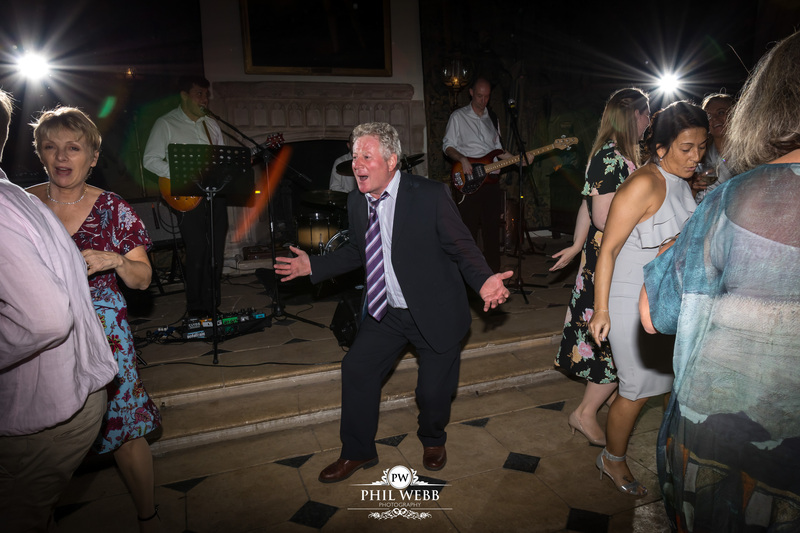 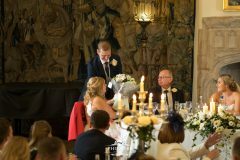 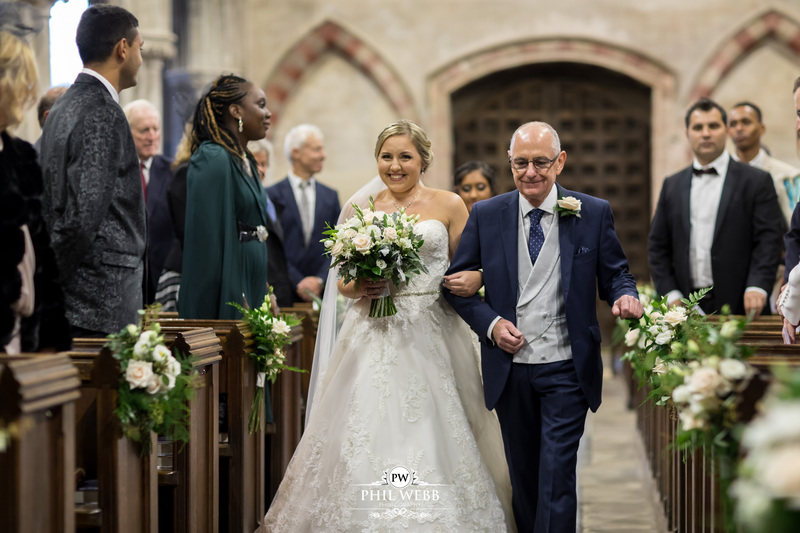 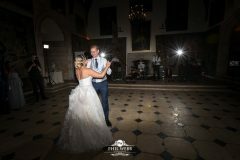 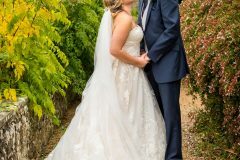 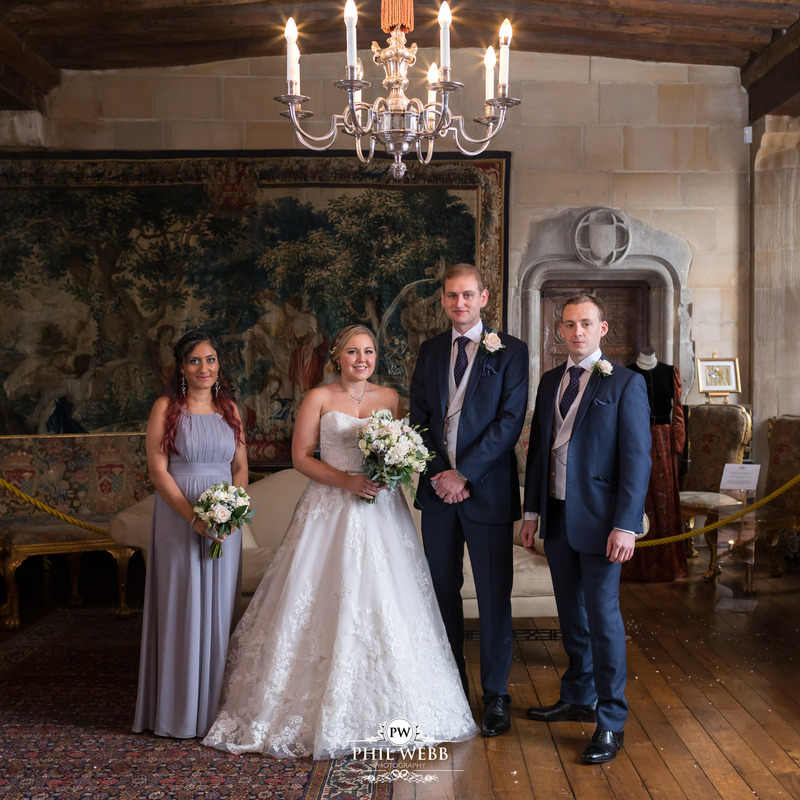 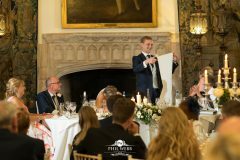 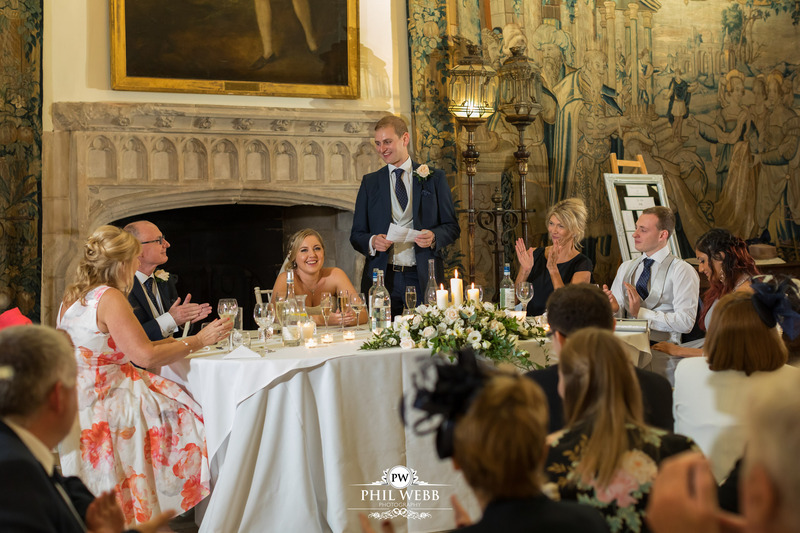 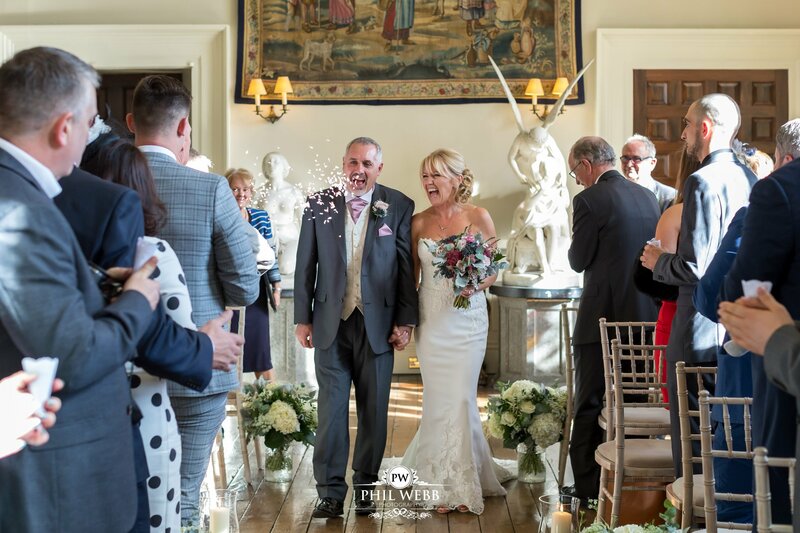 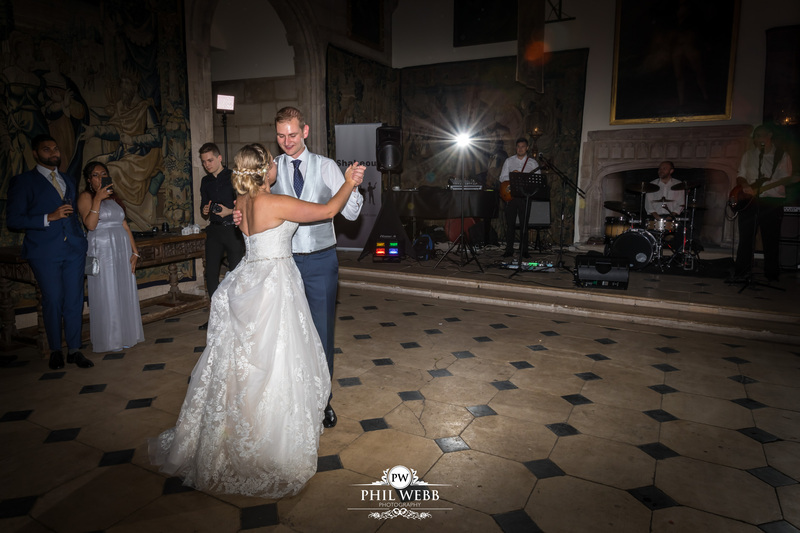 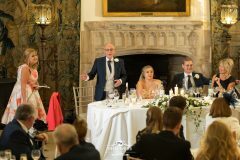 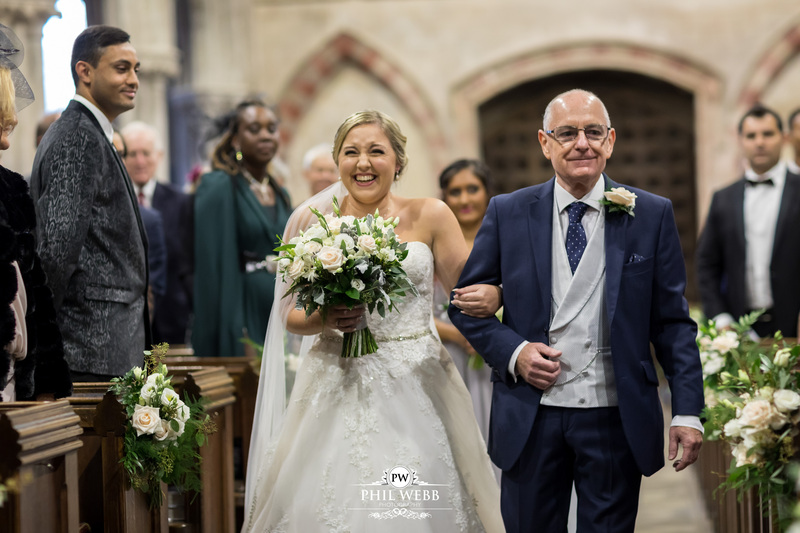 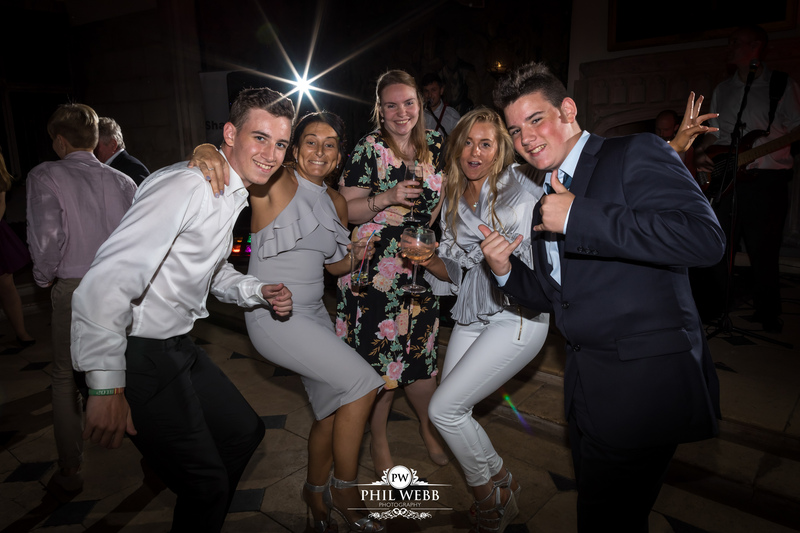 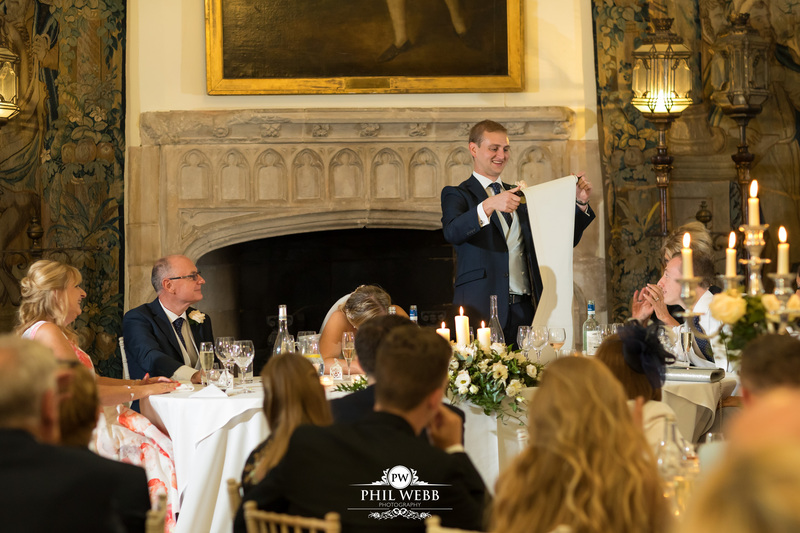 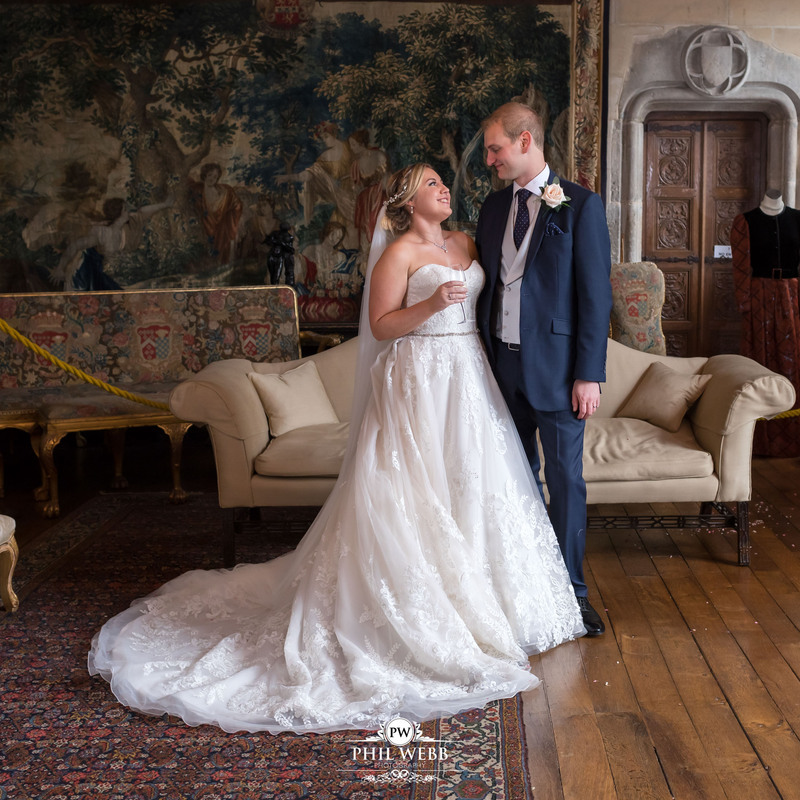 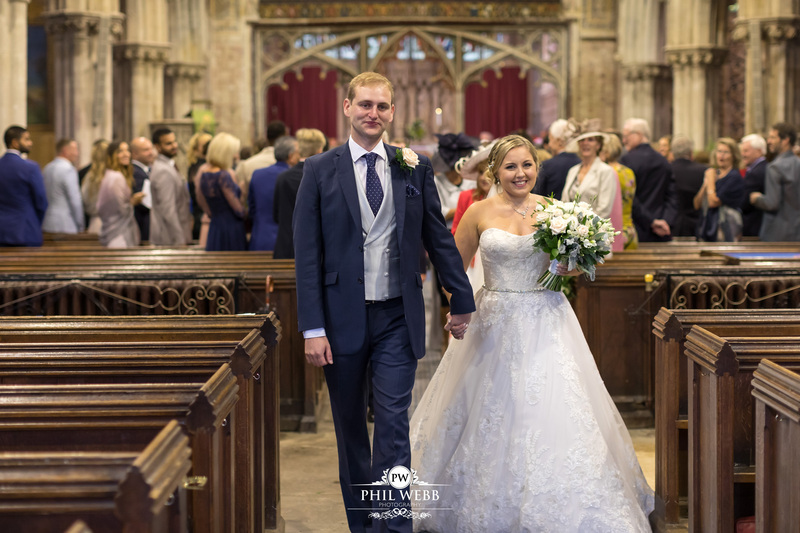 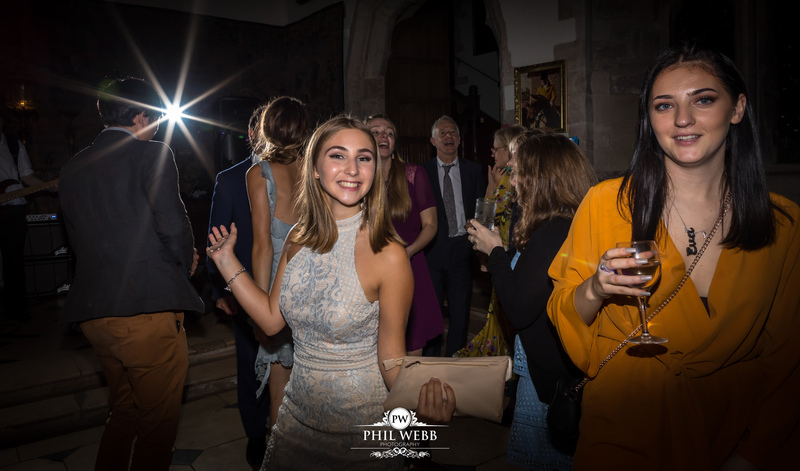 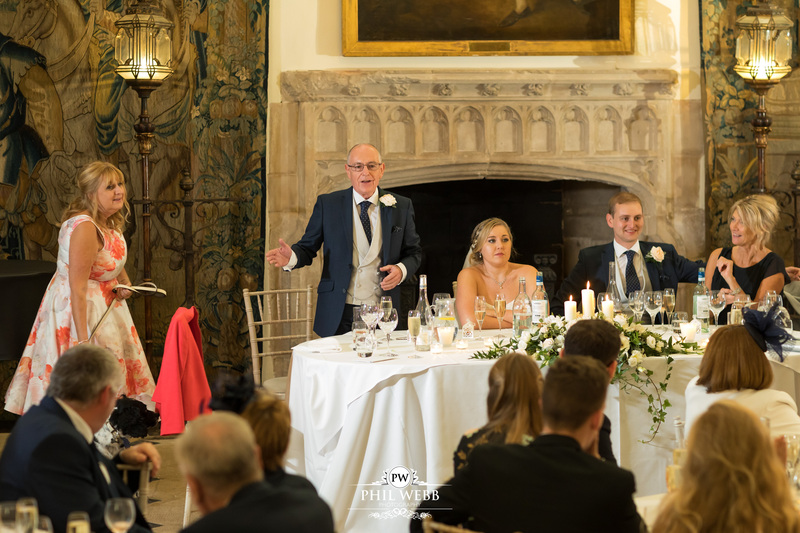 Claire and her family had travelled from their London home to meet a variety of wedding suppliers to arrange their Cotswold wedding. 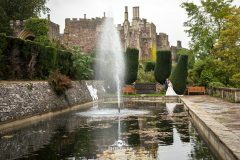 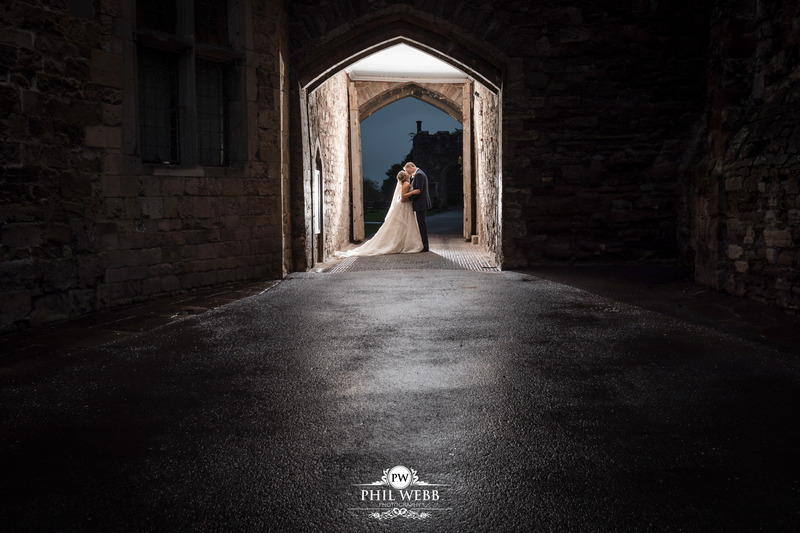 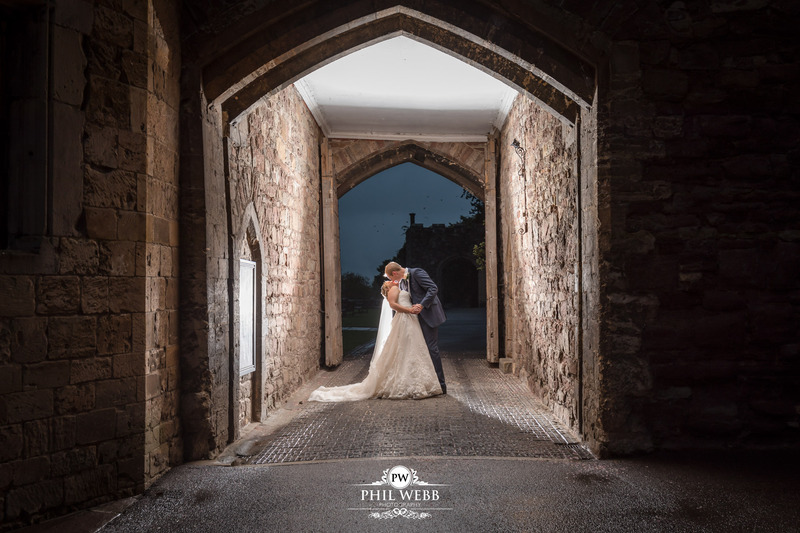 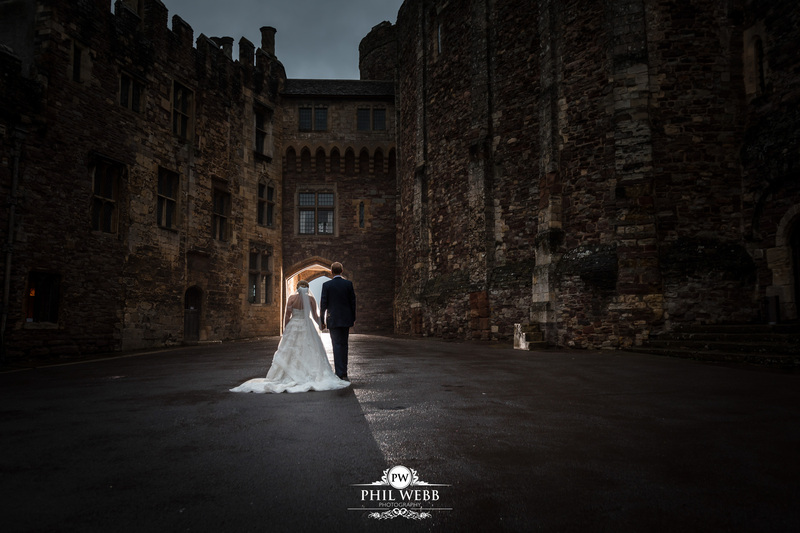 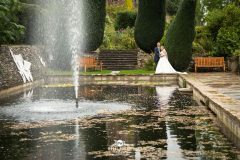 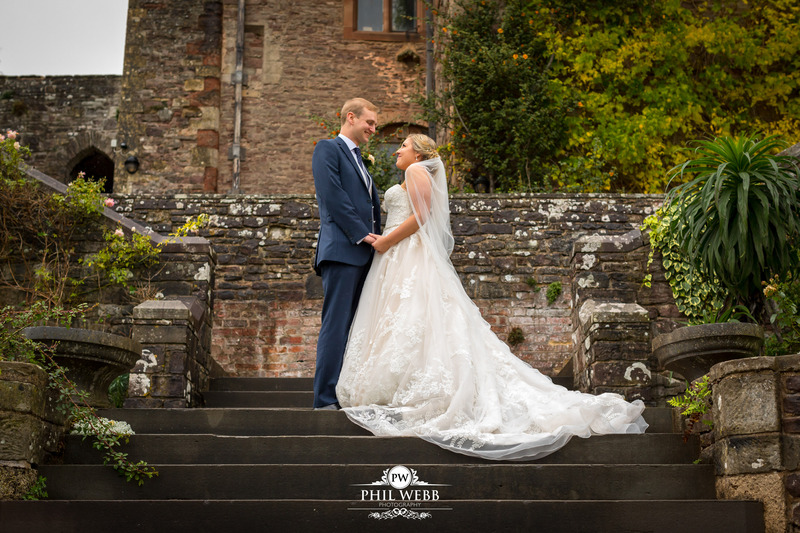 They chose Berkley Castle as their wedding venue because of its grandeur. The castle is in Berkley town centre Gloucestershire, just north of Bristol. 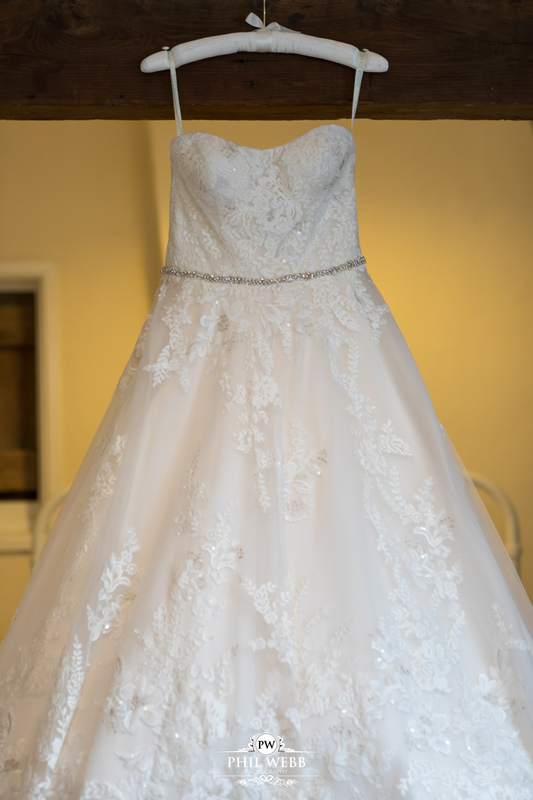 Claire’s bridal preparations took place in a guest house, next to St Mary’s Church in the town of Berkley. 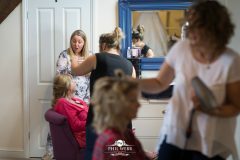 Claire had all her family and bridesmaids together at the guest house. Claire and Jonathan’s dog was also part of the preparations. 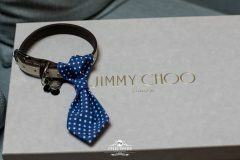 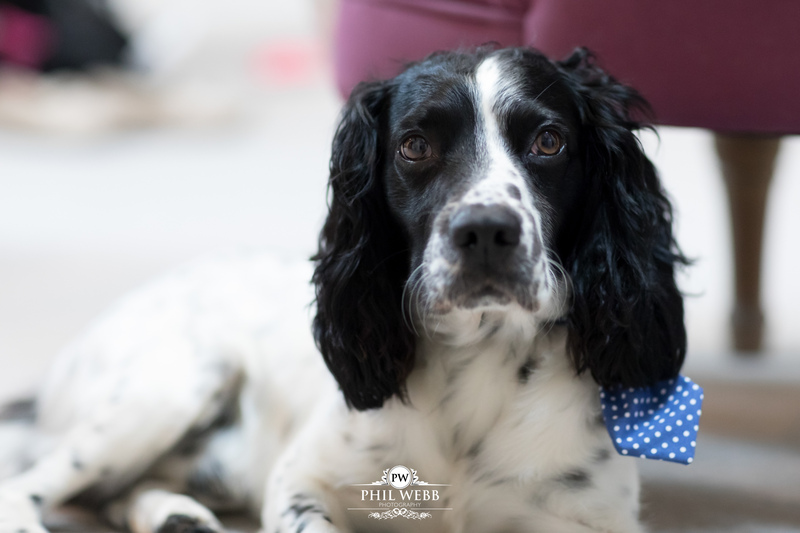 He put on his collar and tie ready for the ceremony after his pamper session. 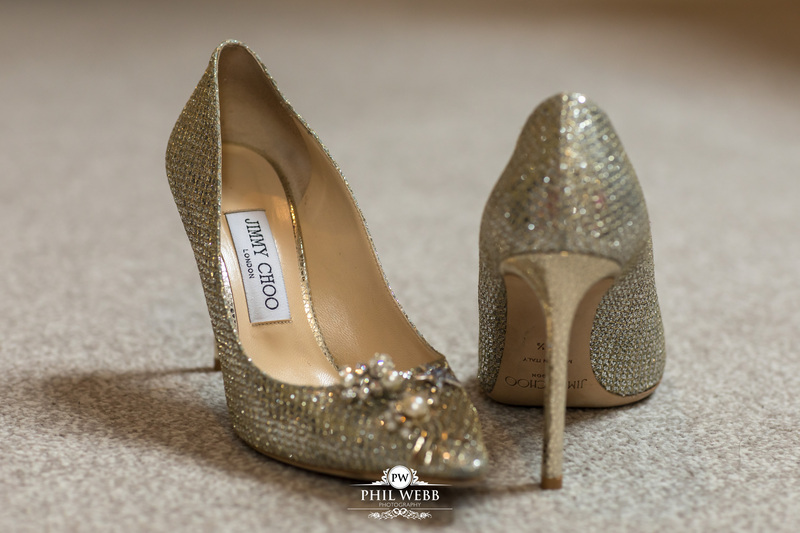 Claire’s plan after slipping on her lovely Jimmy Choo’s, had been to walk to St Mary’s Church. 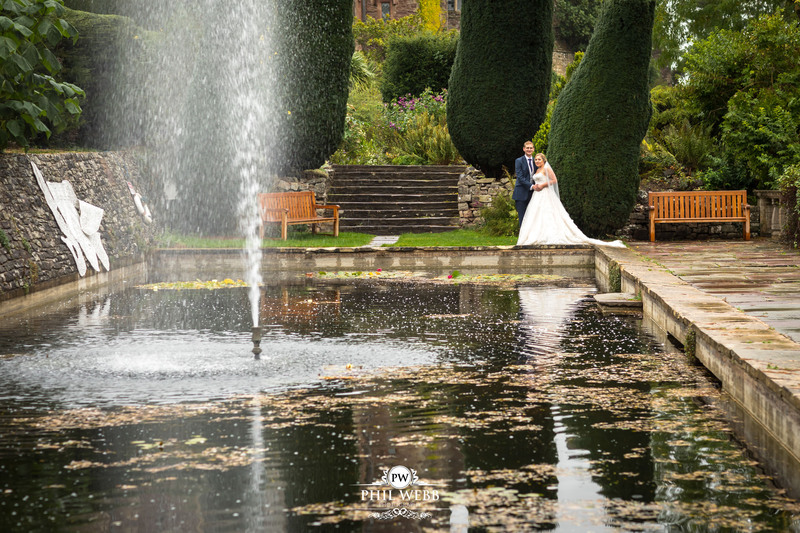 The September weather was unfortunately not so kind. After one of the best summers we have seen in years, the rain did not stop! 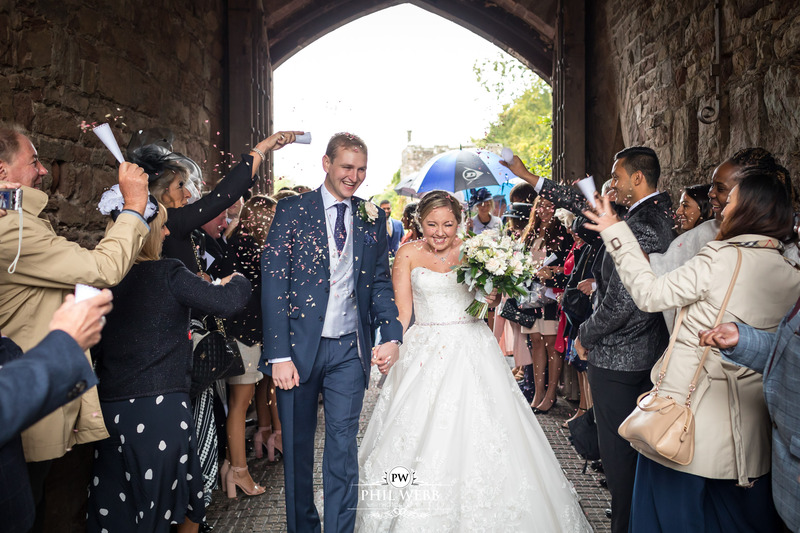 As with most weddings, even the wettest of weather could not dampen spirits or the atmosphere. 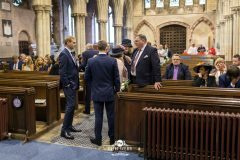 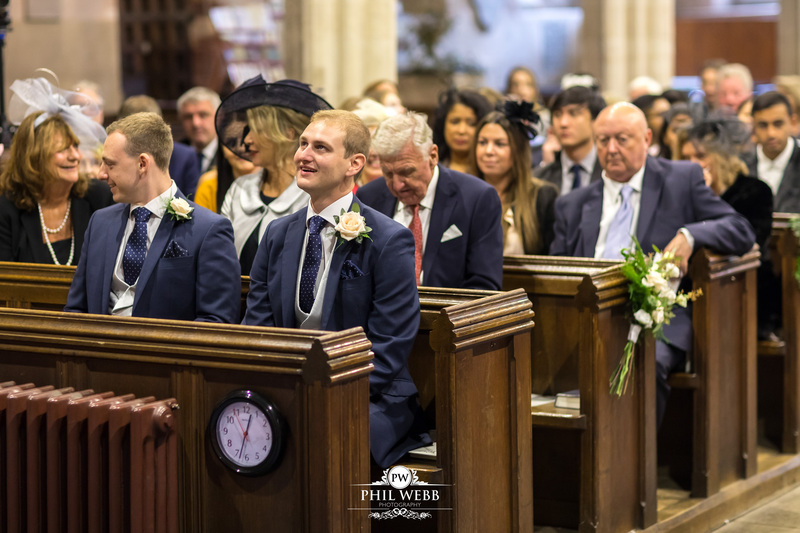 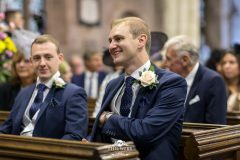 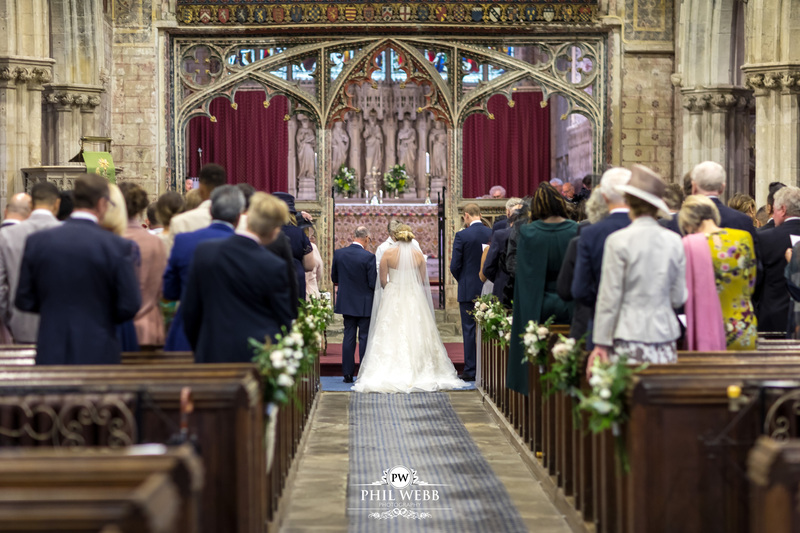 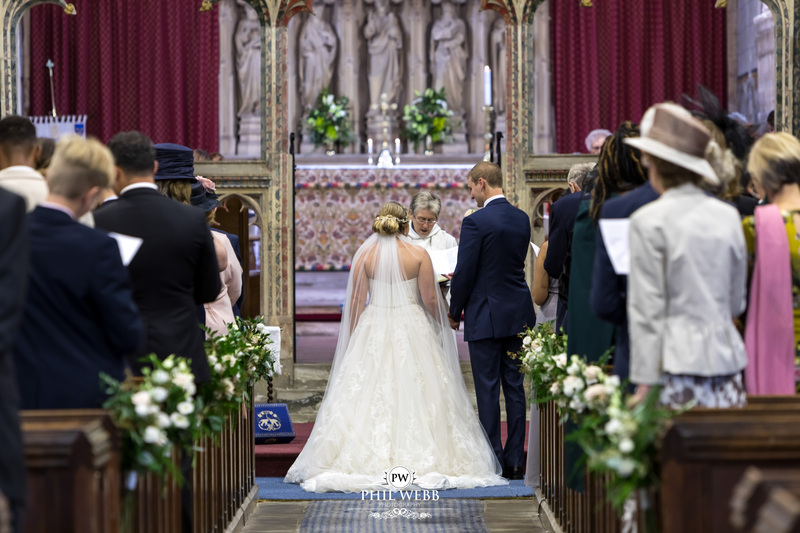 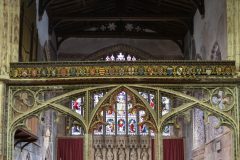 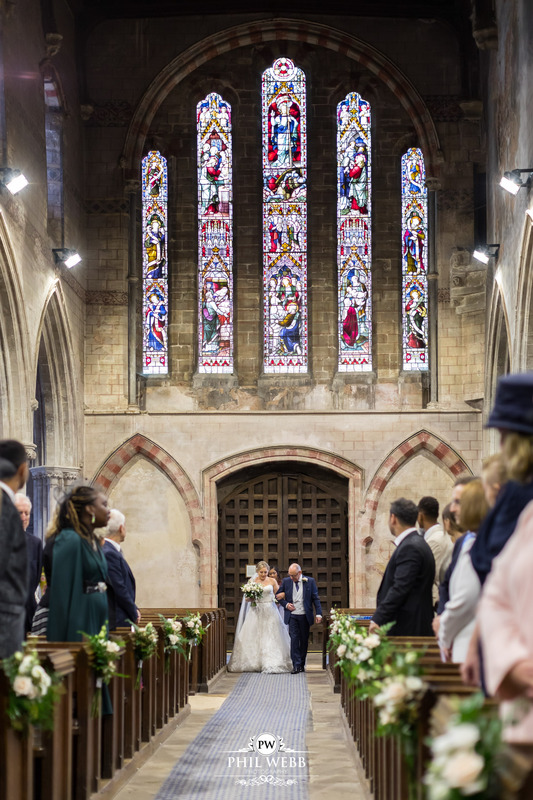 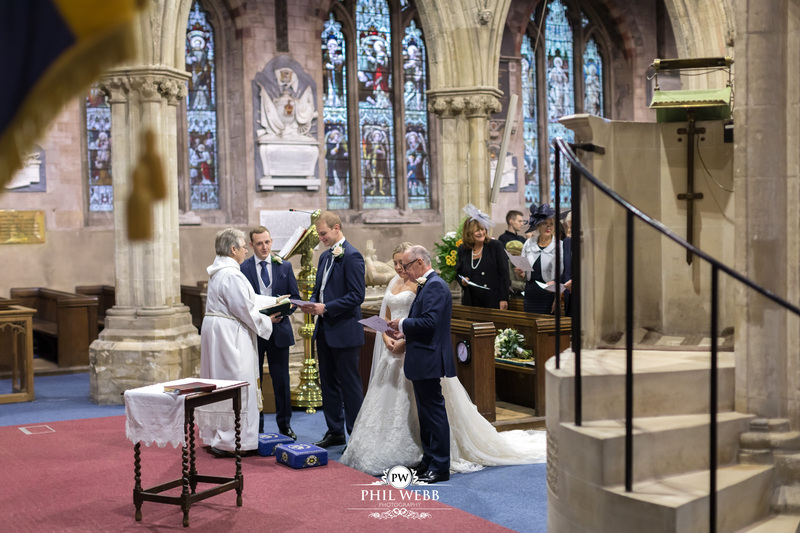 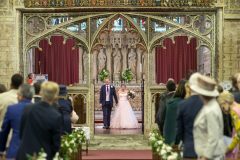 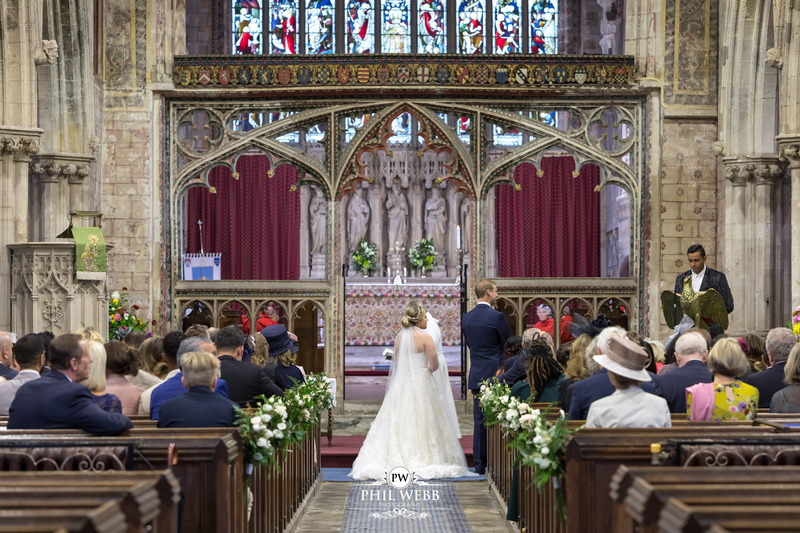 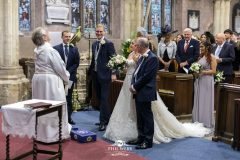 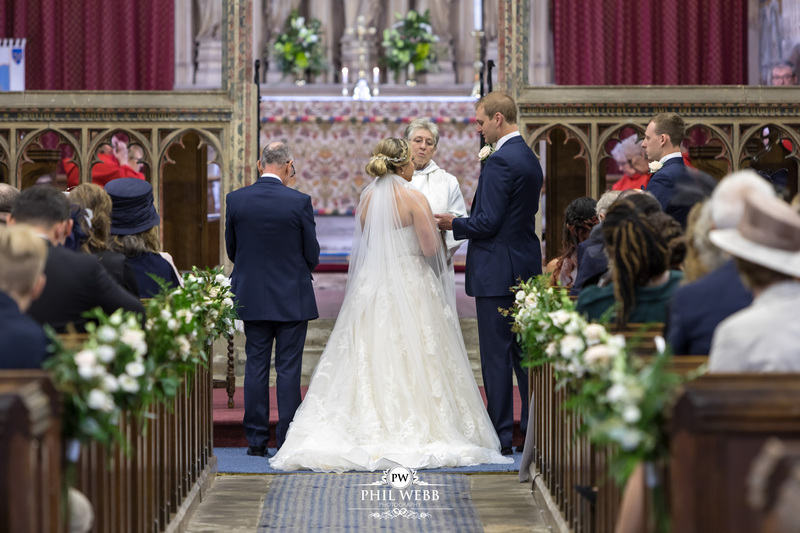 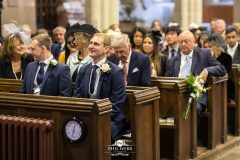 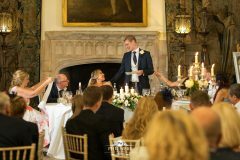 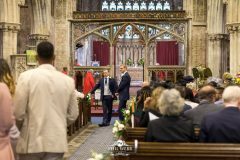 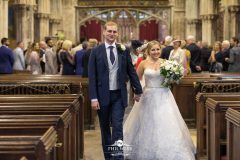 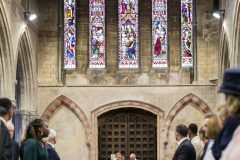 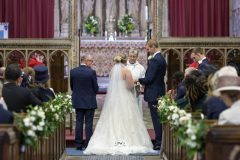 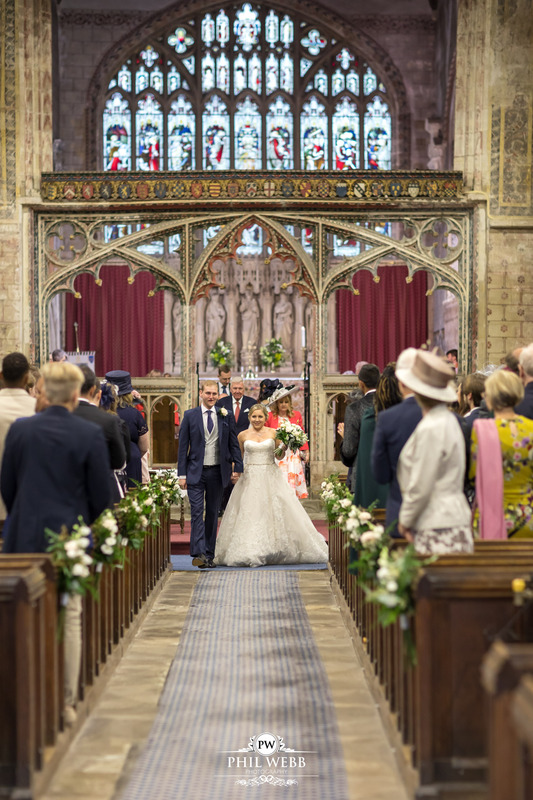 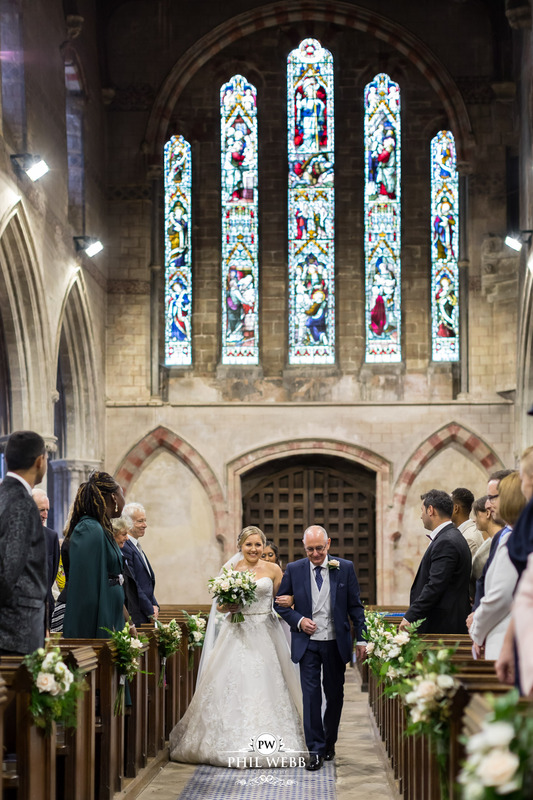 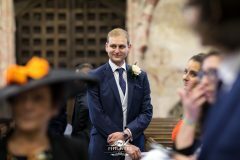 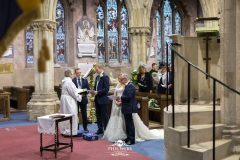 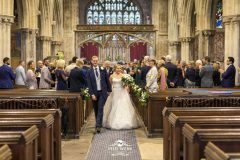 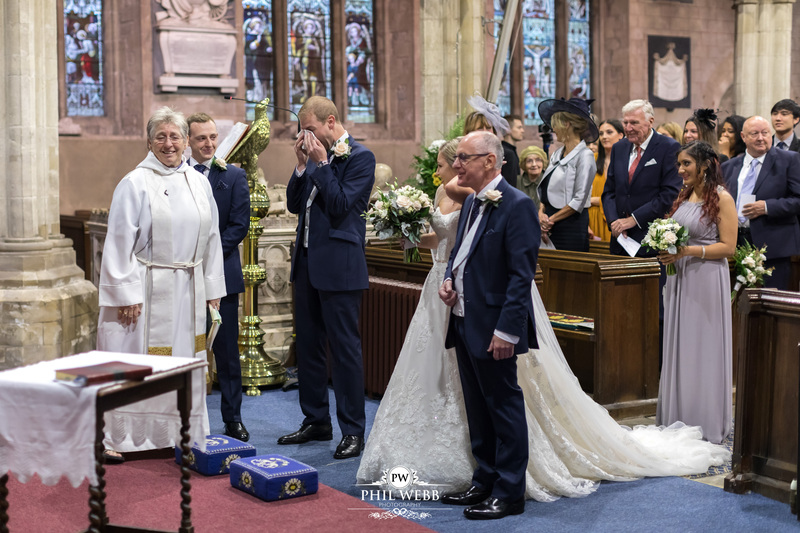 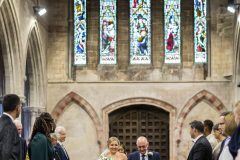 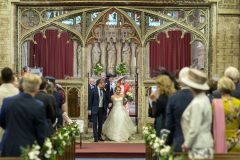 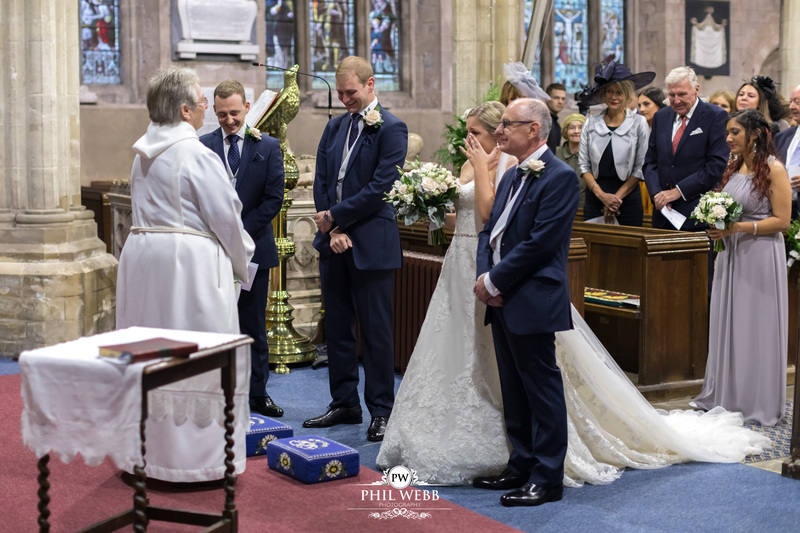 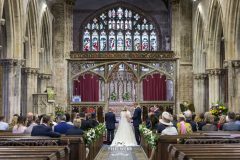 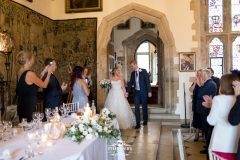 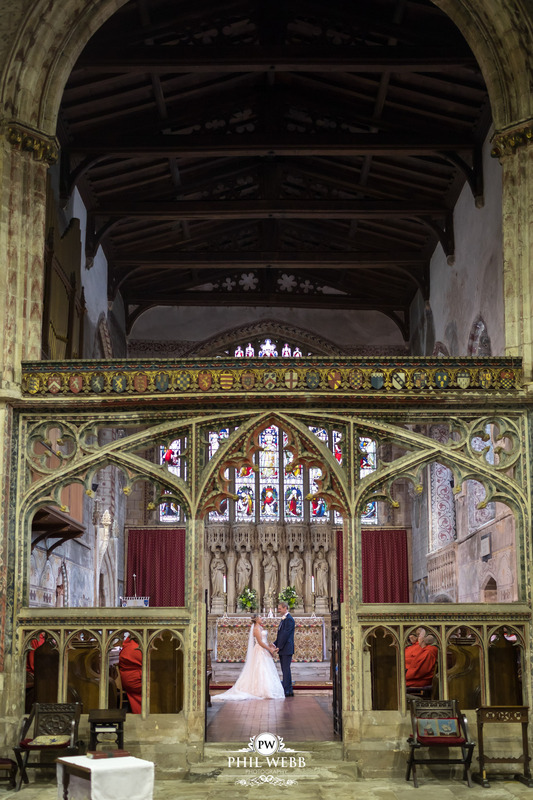 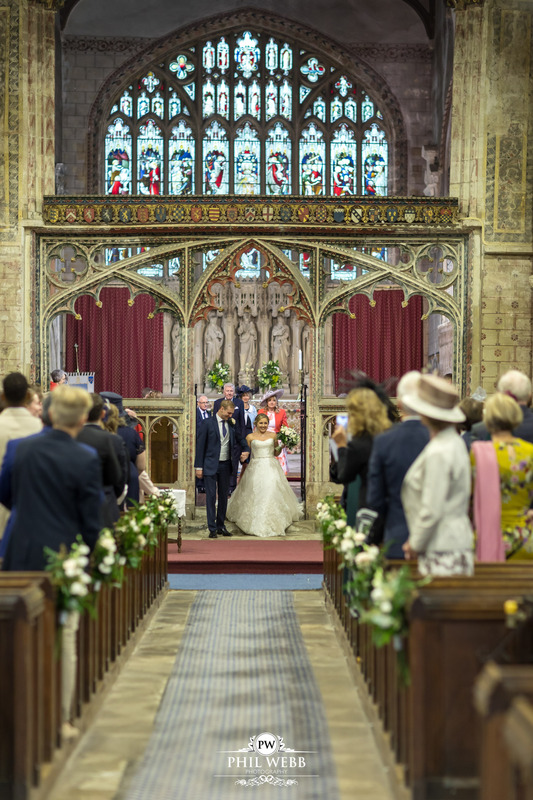 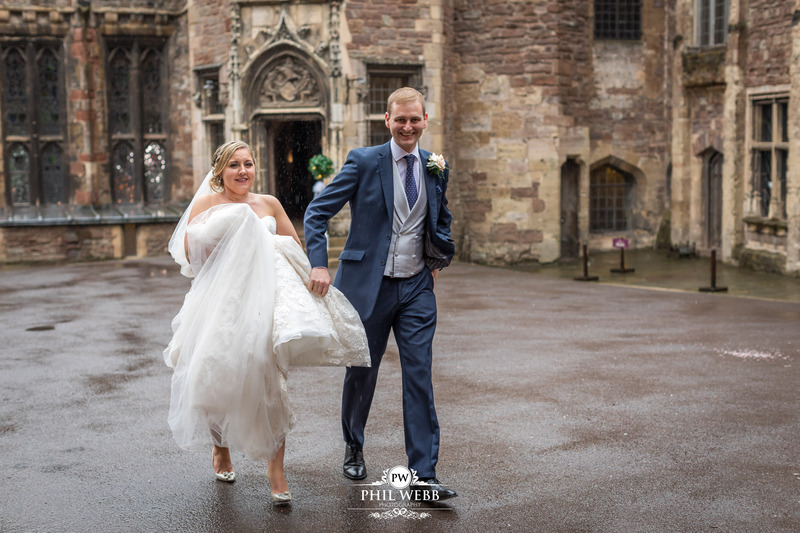 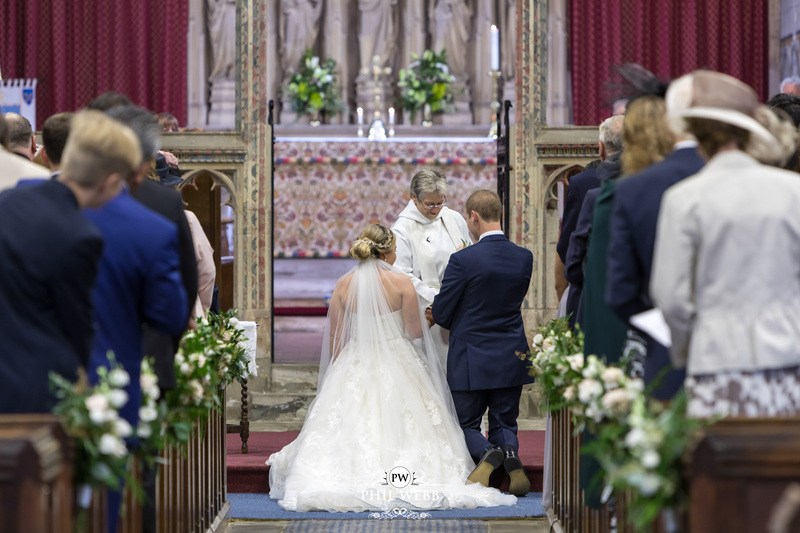 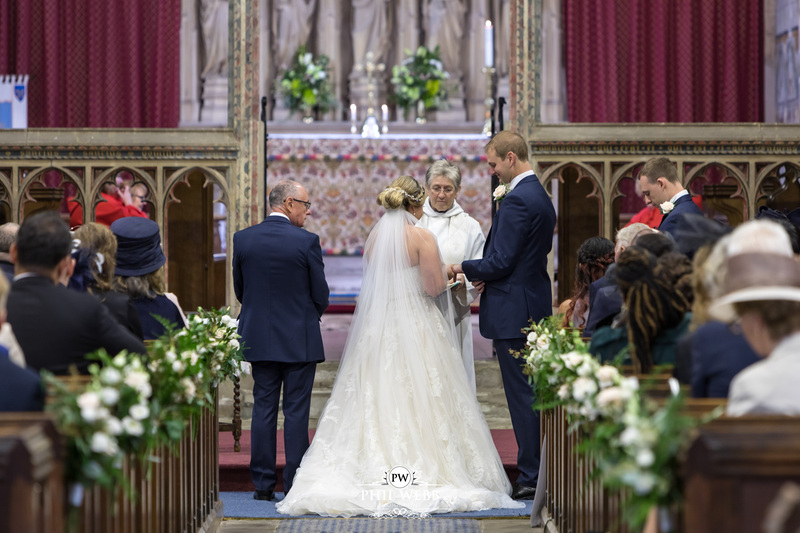 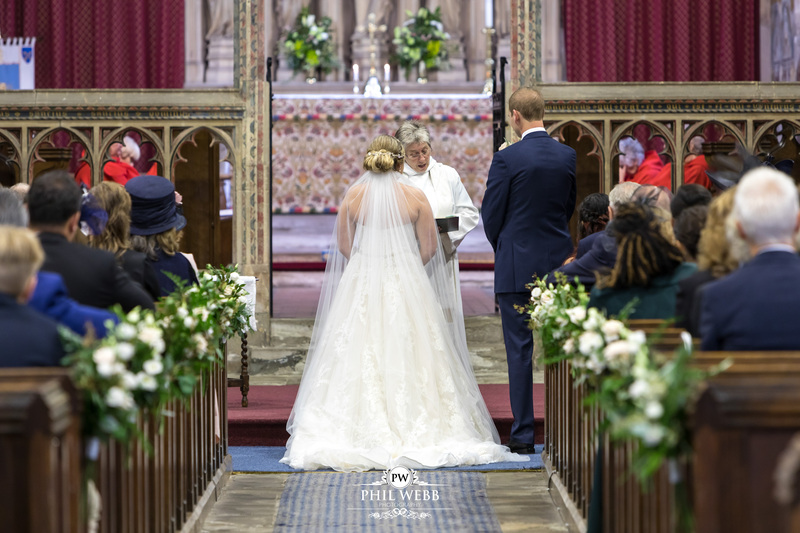 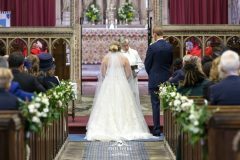 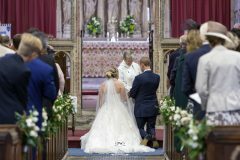 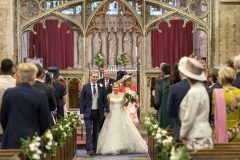 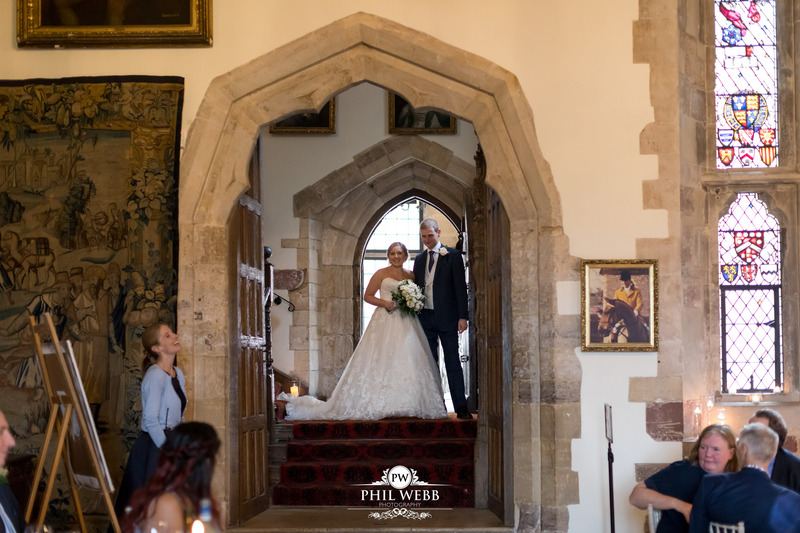 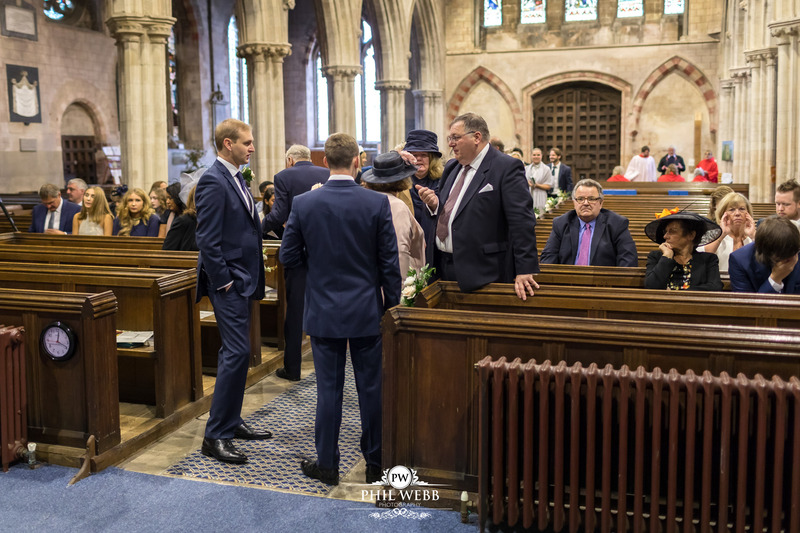 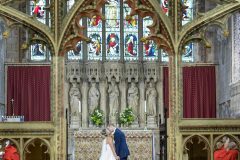 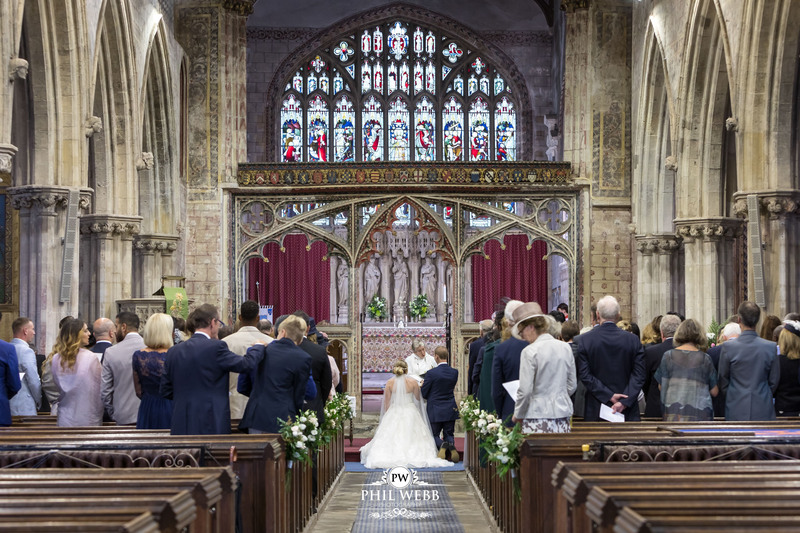 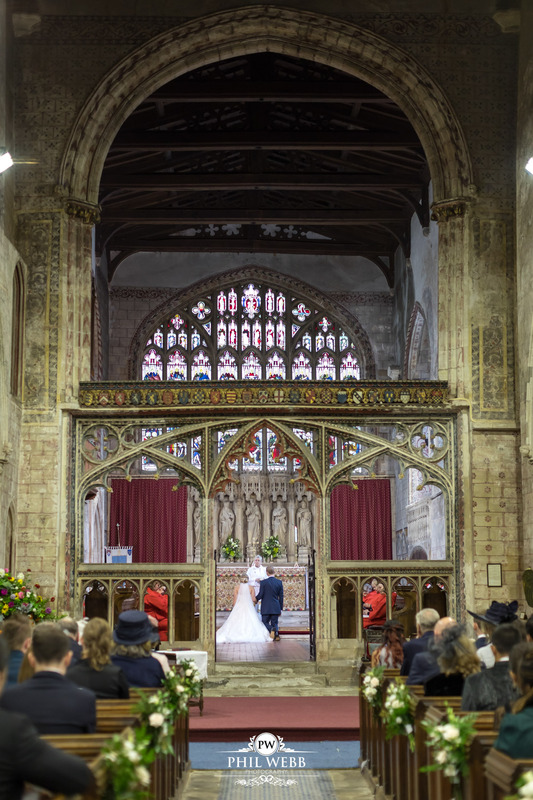 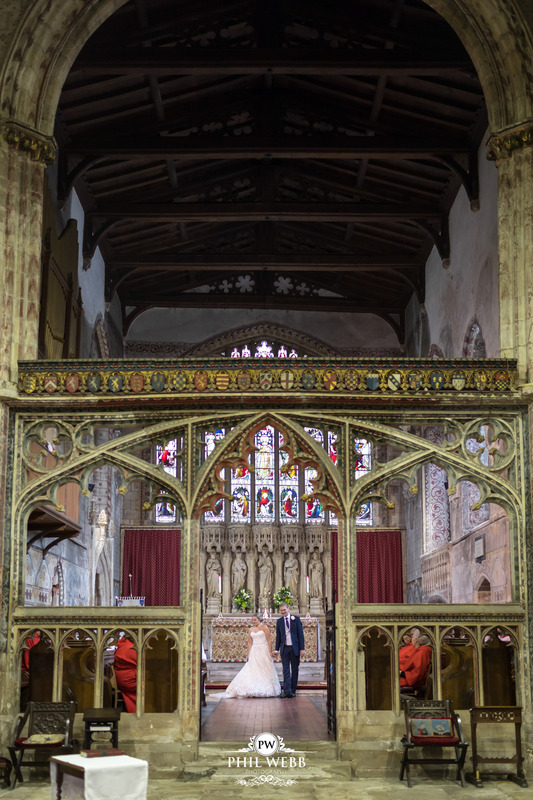 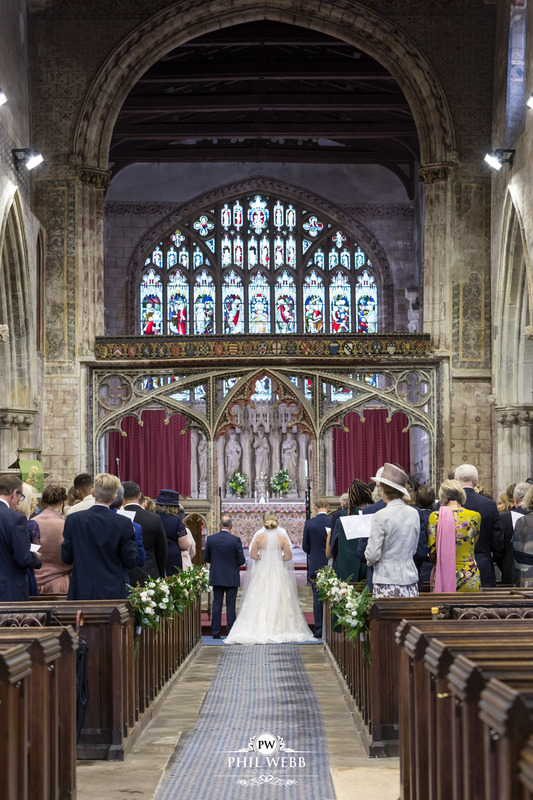 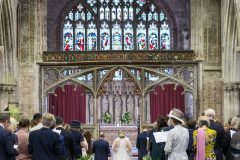 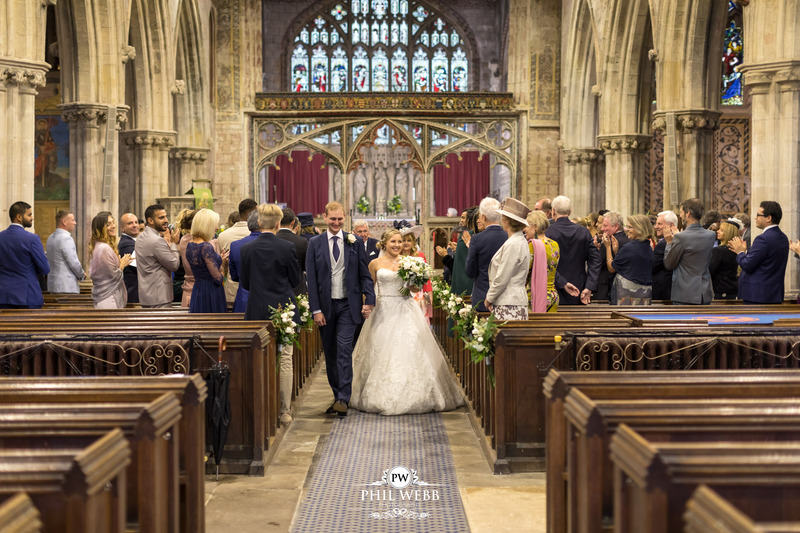 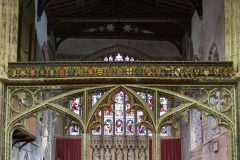 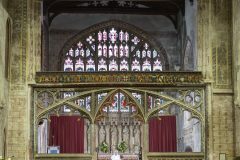 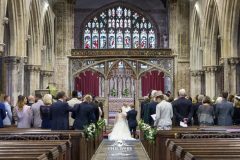 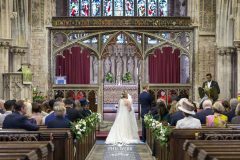 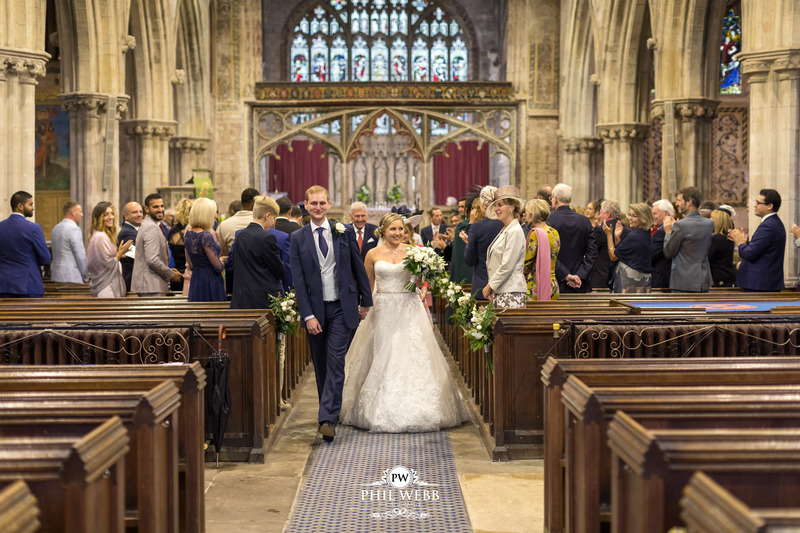 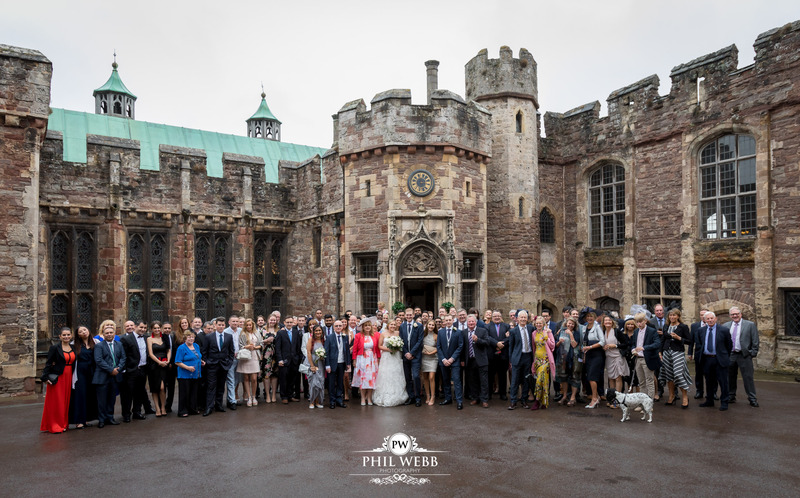 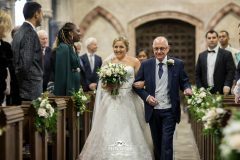 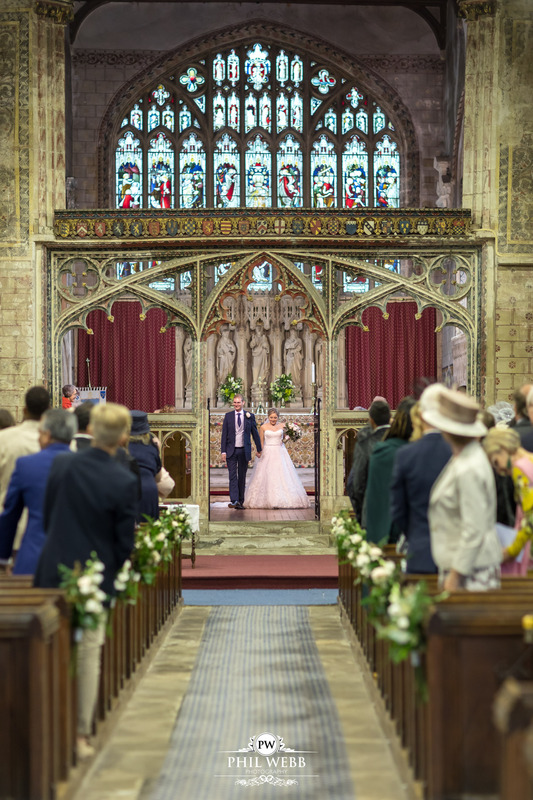 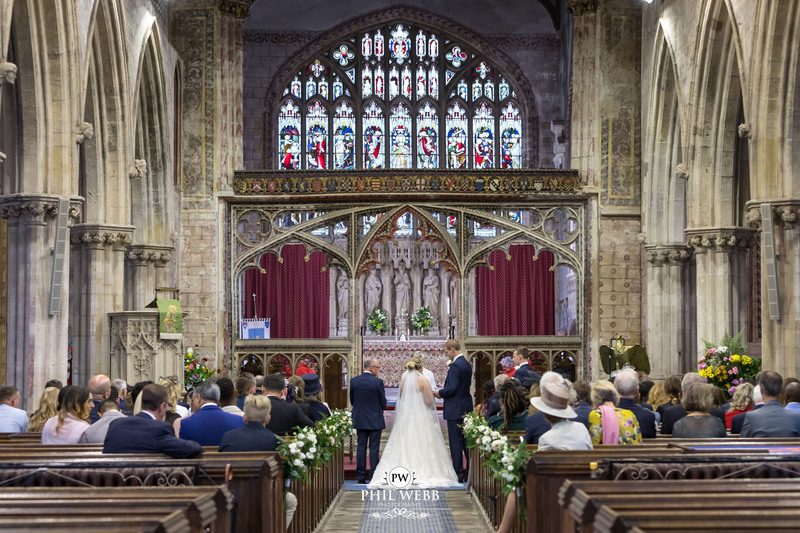 The ceremony at the very impressive St Mary’s Church Berkley proceeded without a hitch, after which it was a short walk to the splendour of Berkeley Castle. 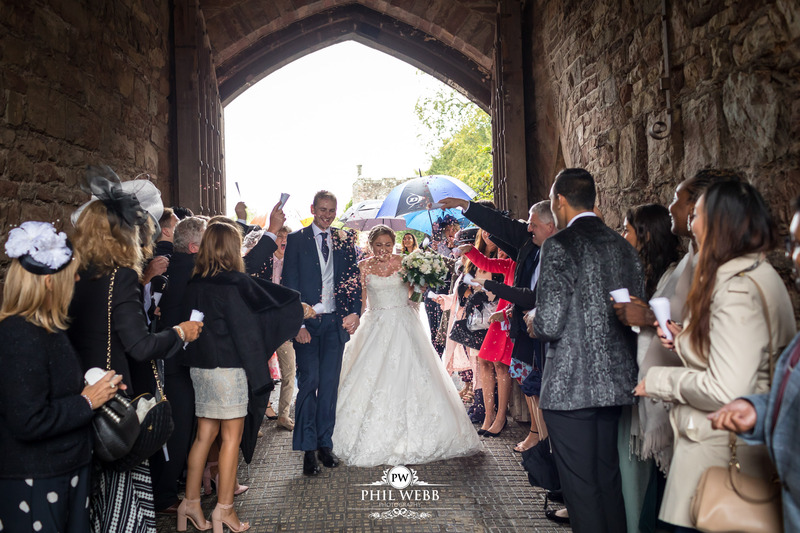 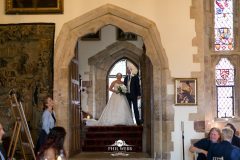 We got a great confetti picture under an archway just within the grounds of Berkley Castle. 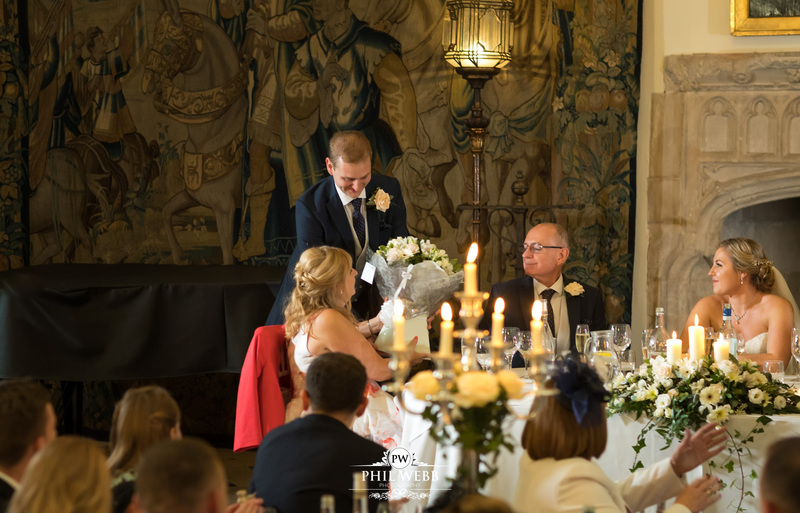 Claire & Jonathan’s drinks reception took place in the drawing room, as the rain continued outside. 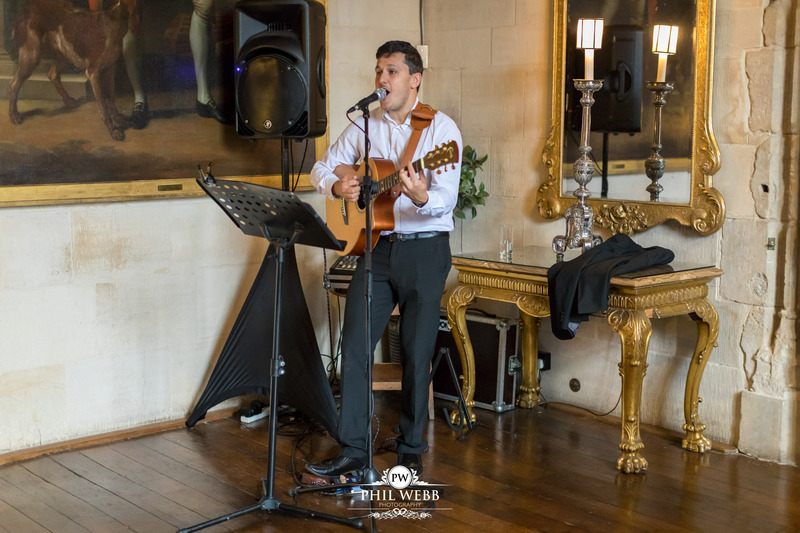 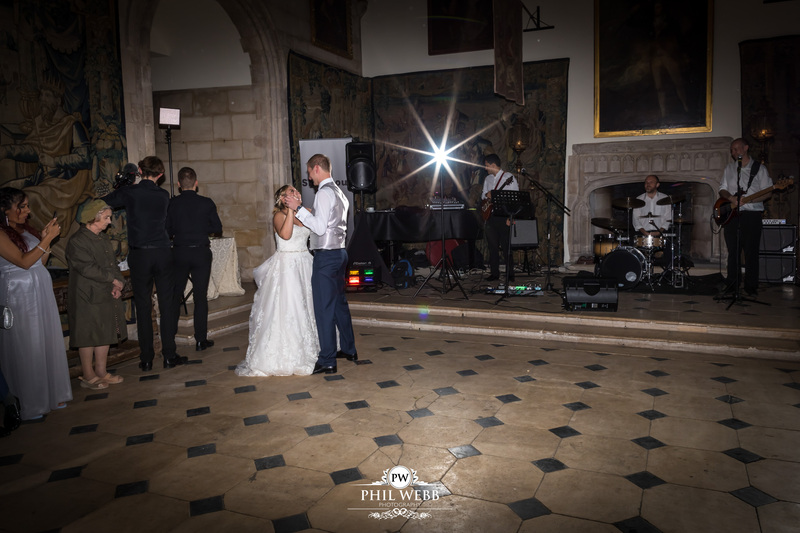 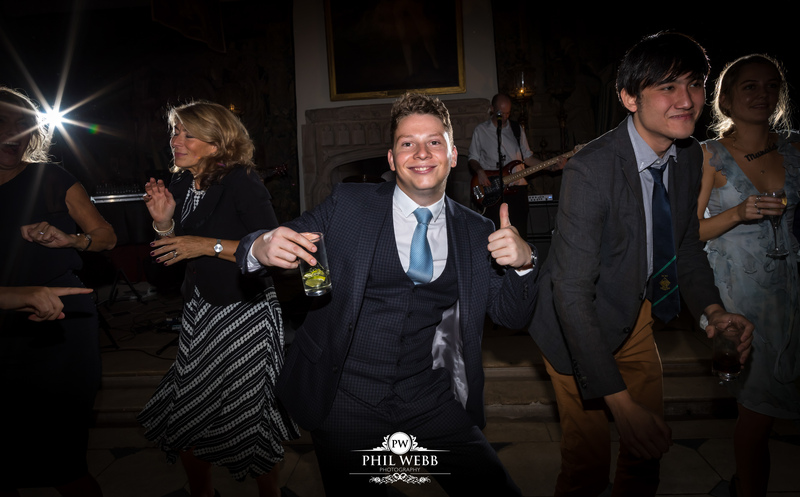 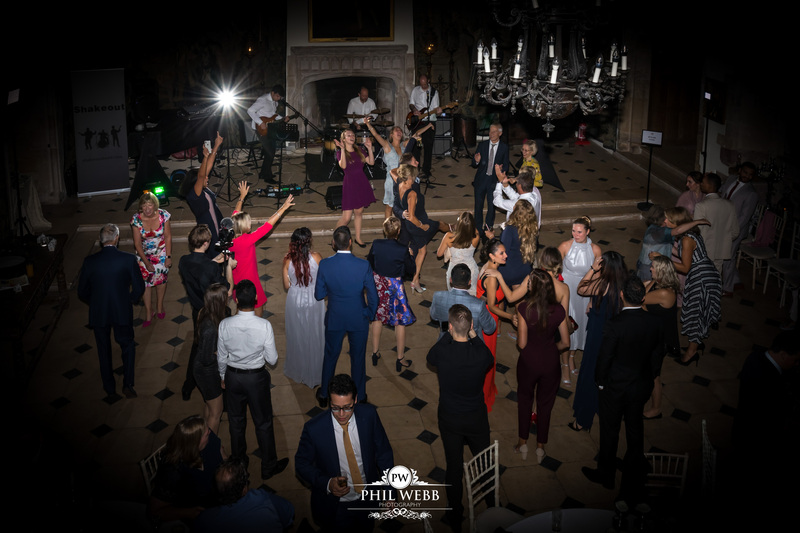 A member of the band Shakeout provided acoustic musical entertainment whilst the guests enjoyed drinks and canapés. 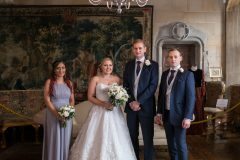 Because of the rain all but one of the formal photographs had to be taken in the drawing room. There was a mild break in the weather of literally a minute when the rain turned to drizzle. 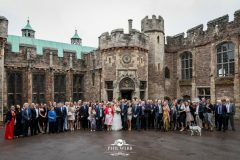 The guests all made a dash outside and we managed to complete a group shot of everyone. 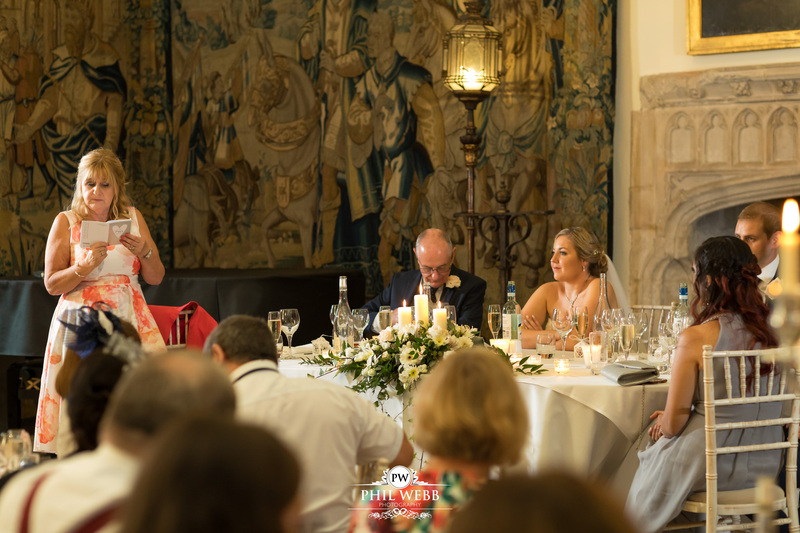 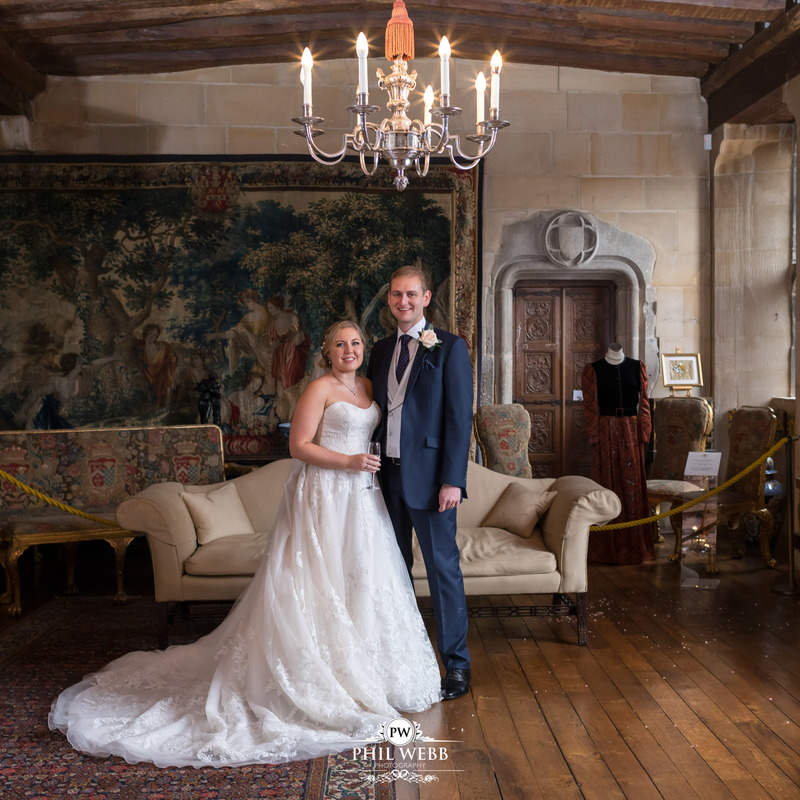 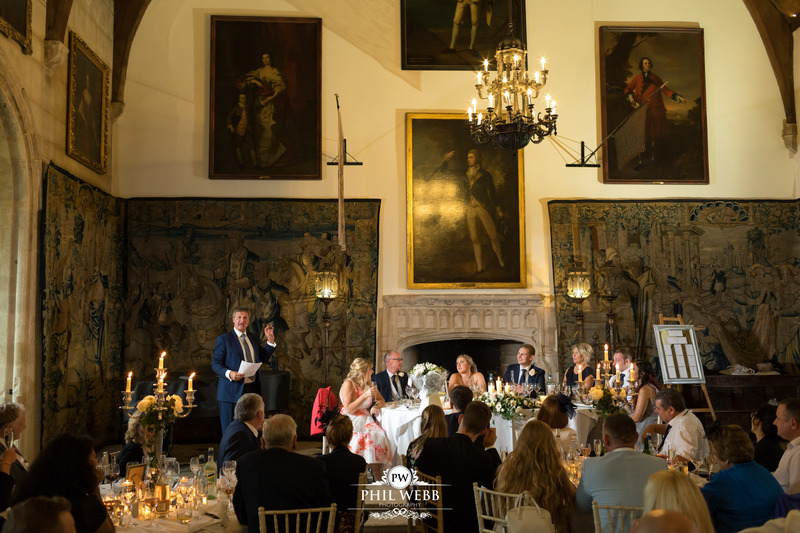 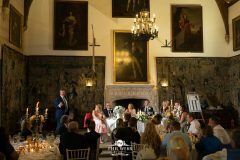 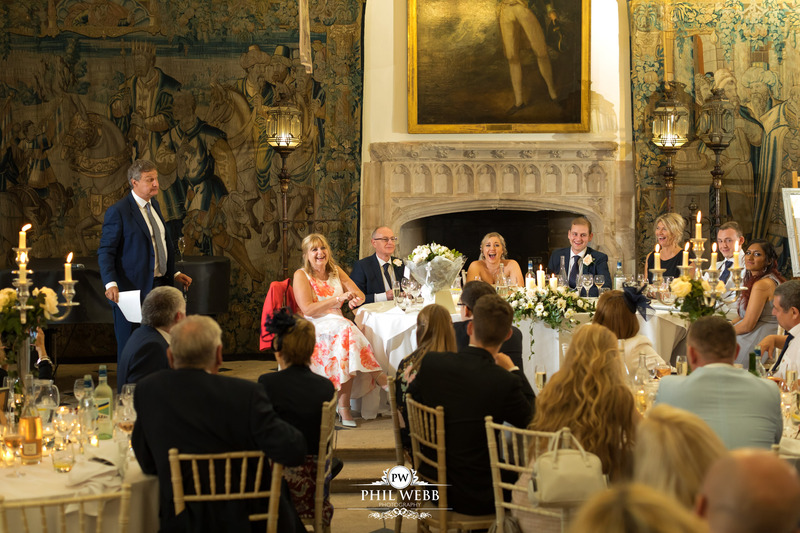 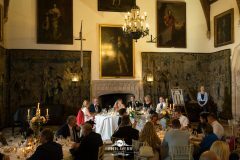 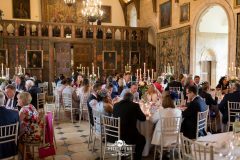 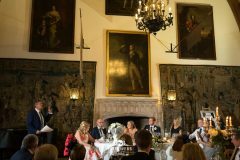 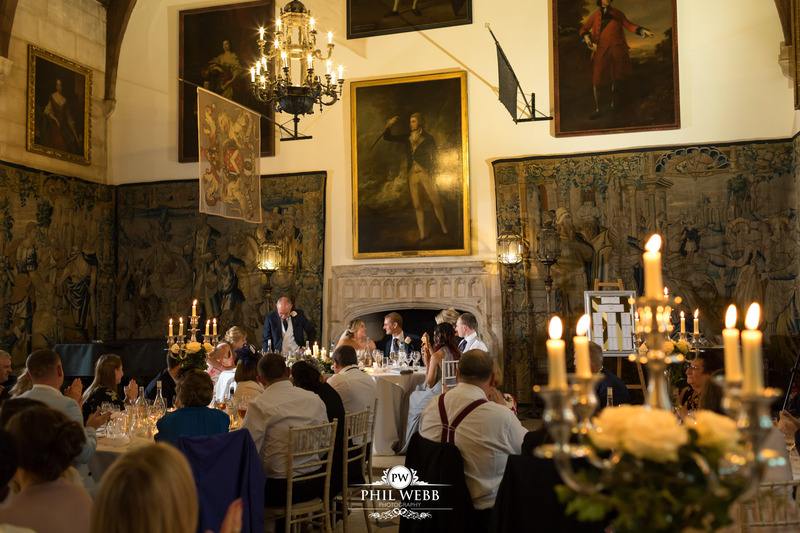 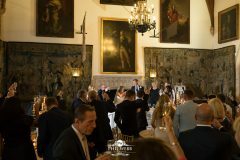 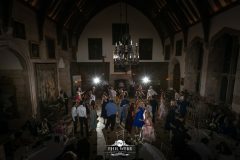 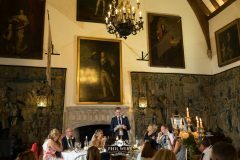 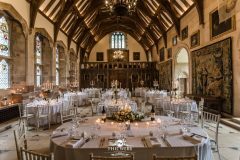 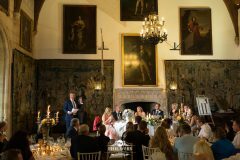 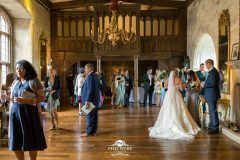 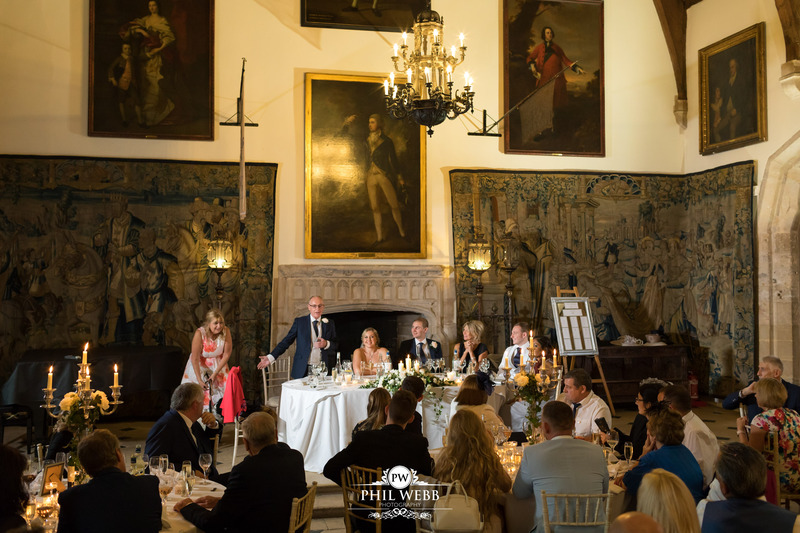 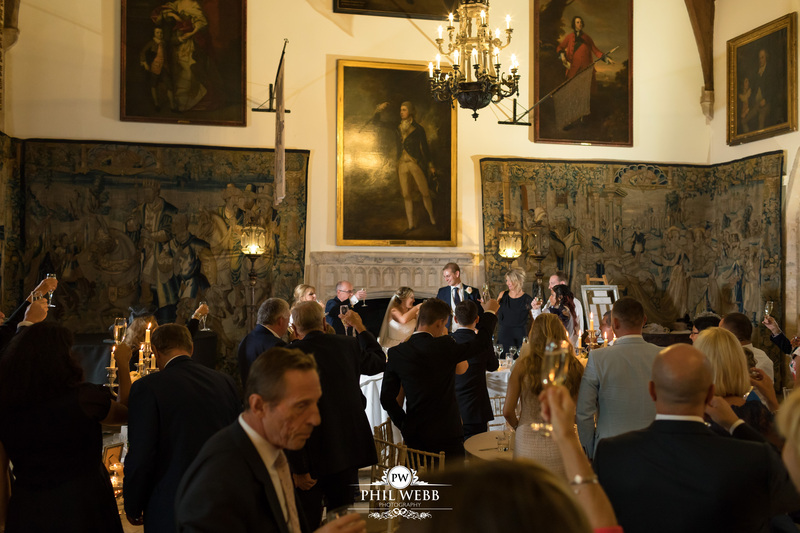 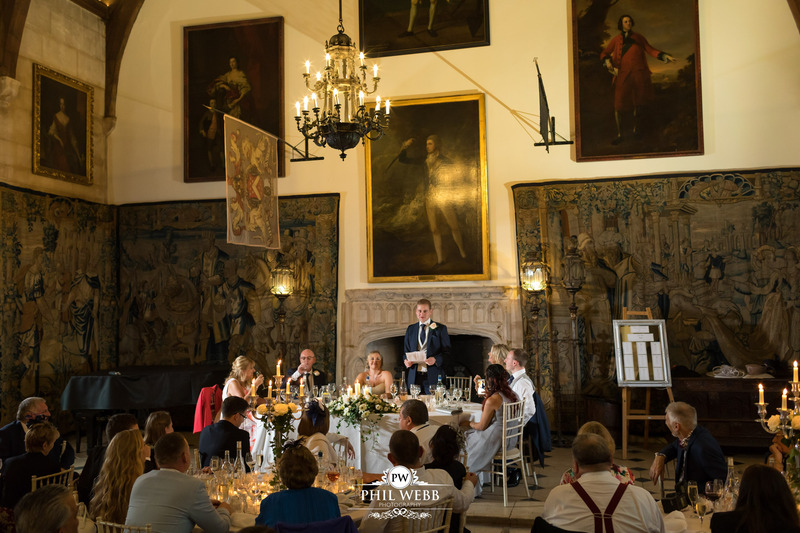 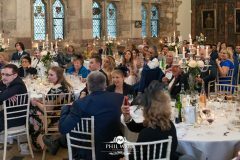 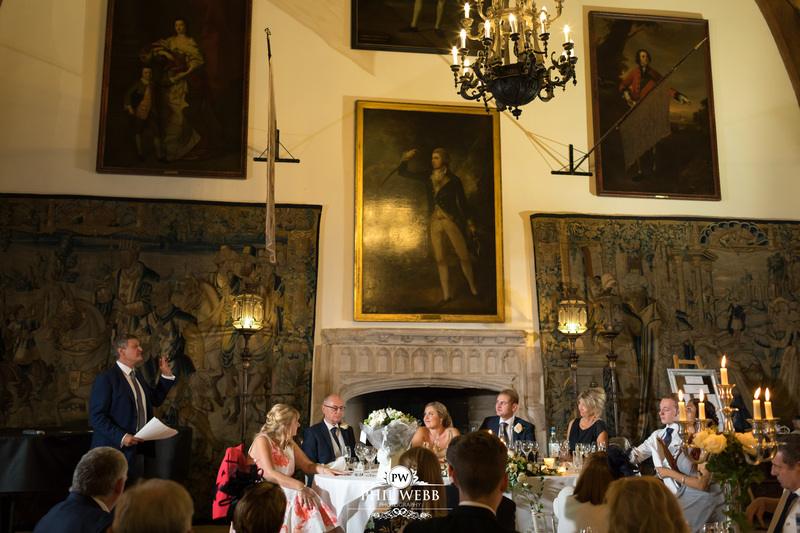 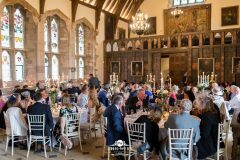 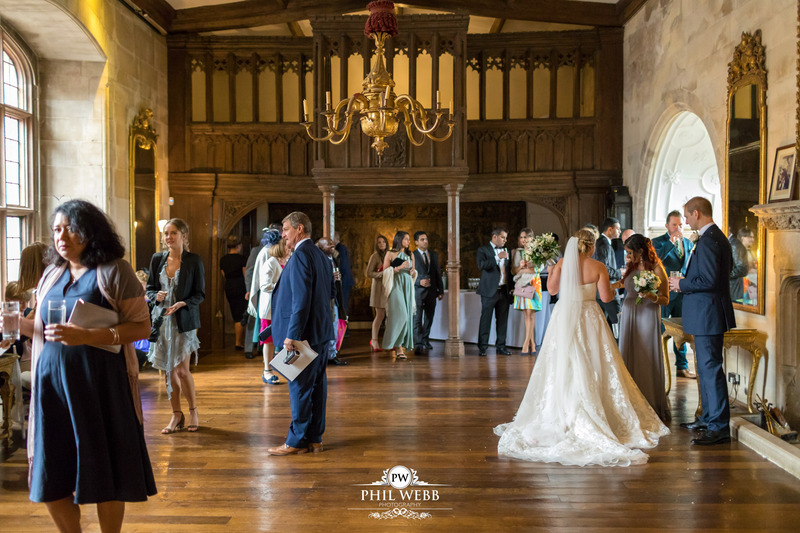 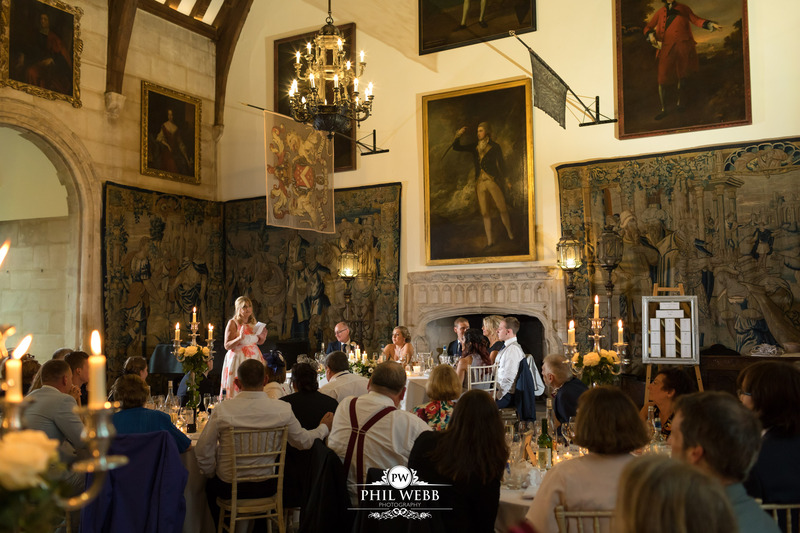 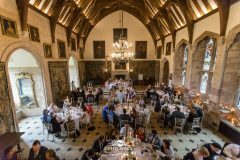 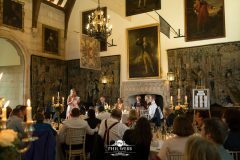 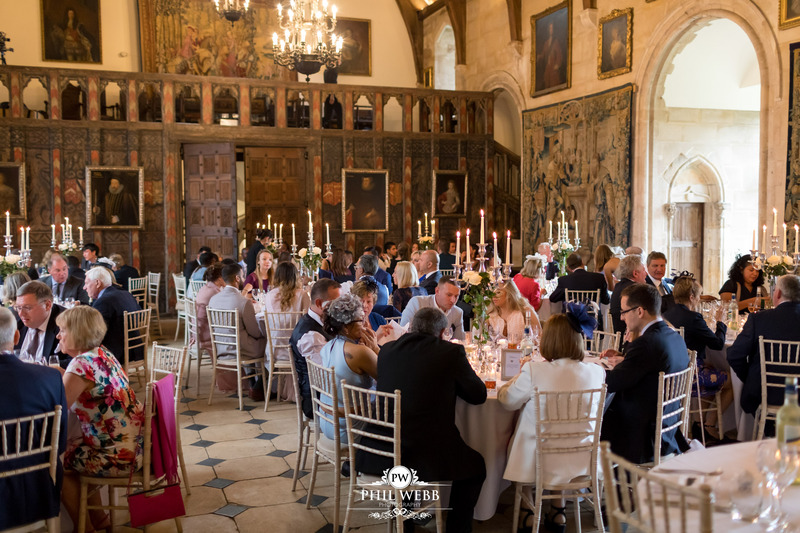 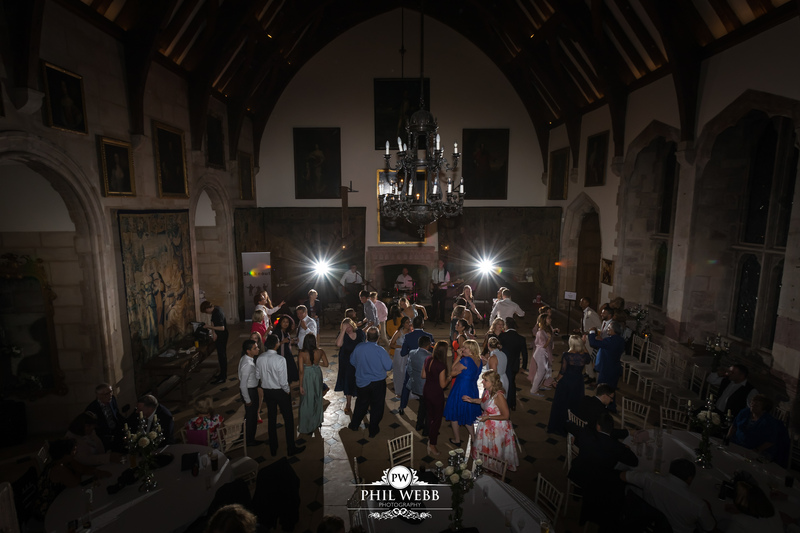 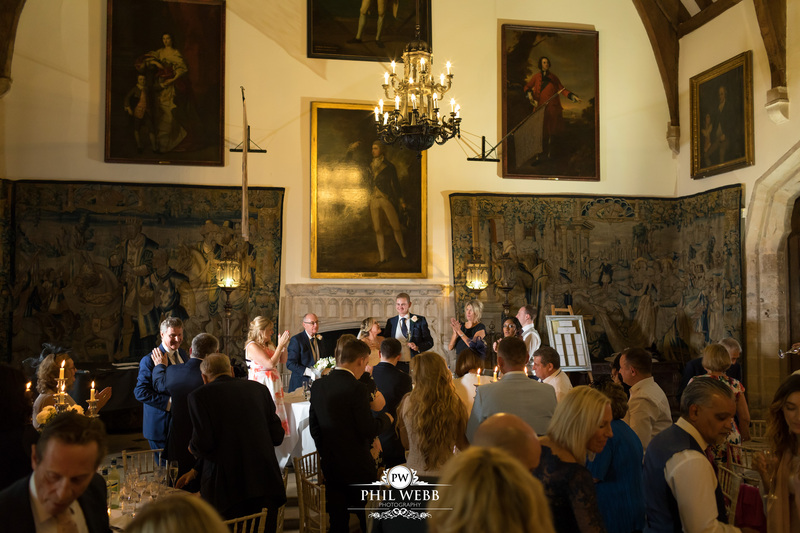 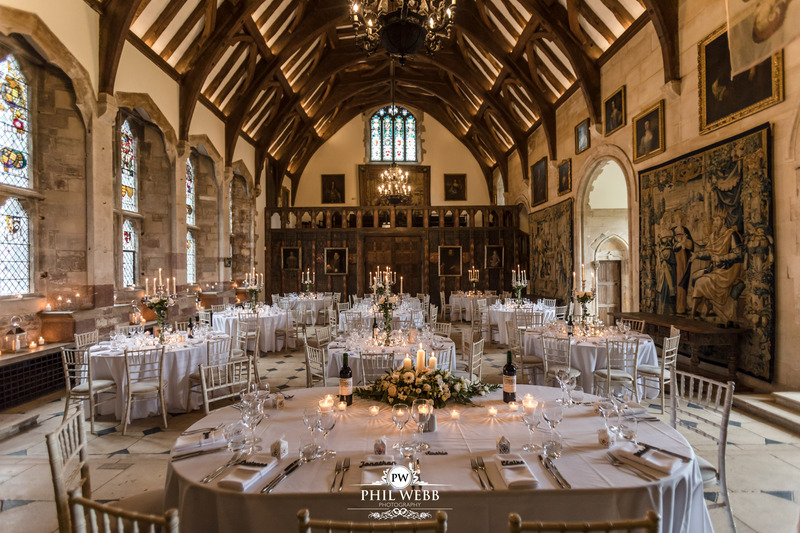 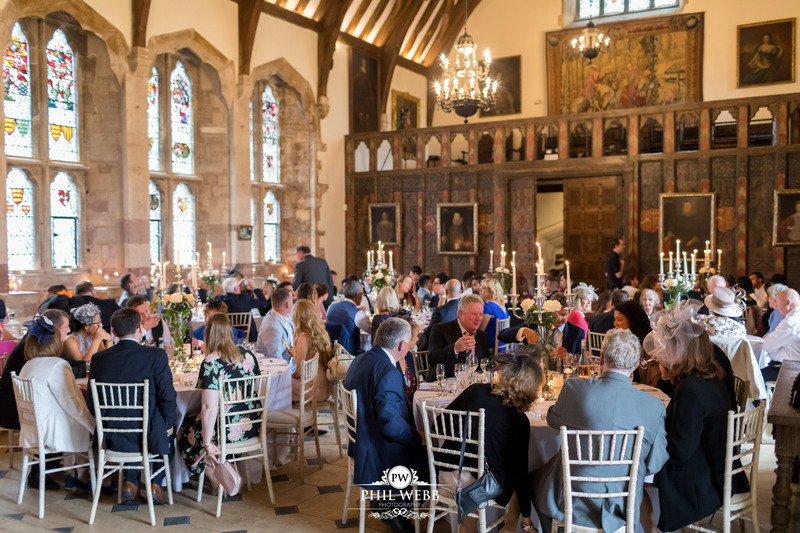 The very impressive and lavish banqueting hall, with its distinctly Medieval feel was the location for Claire & Jonathan’s wedding breakfast. 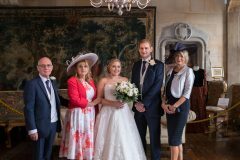 The wedding party and the guests enjoyed their lovely wedding breakfast. 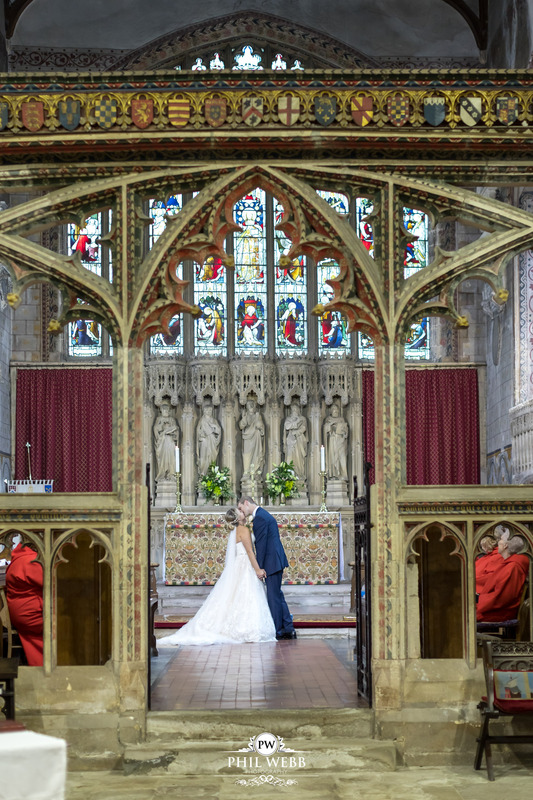 I spent all of my spare time looking out of the window. 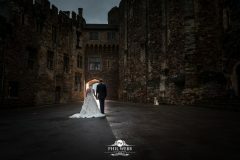 I was waiting and hoping for a break in the weather so we could make use of the wonderful outdoor space. 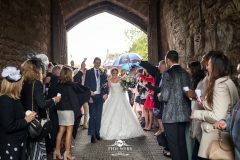 Umbrellas at the ready because the rain had not stopped. So the three of us braved the weather and got some lovely outdoor pictures. 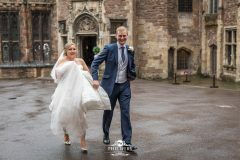 They returned to the banqueting hall for the speeches after drying off. The speeches were very emotional. 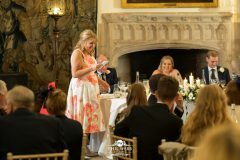 All the speeches went down so well. 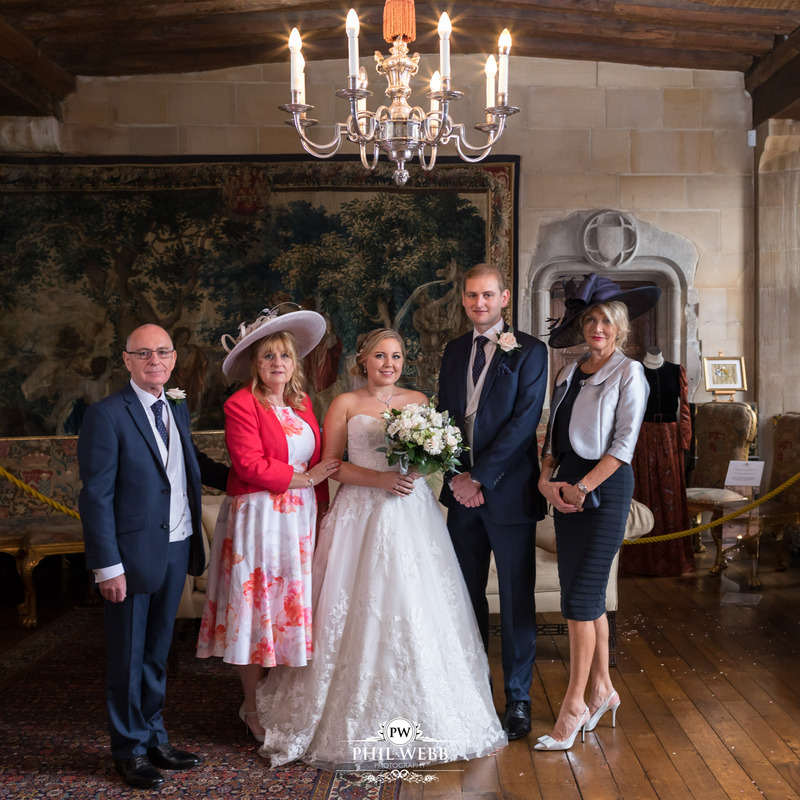 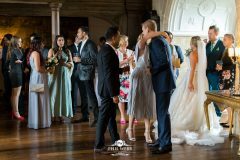 The wedding guests enjoyed a sight seeing tour of the castle after the speeches. The banqueting hall had been turned around on their return and was ready for a big party. 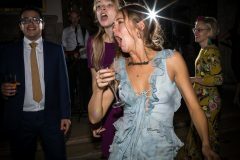 And what a party it was. 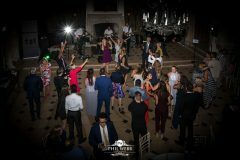 Shakeout band provided some great music. 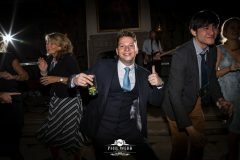 Drinking, laughs and so much dancing continued into the night. 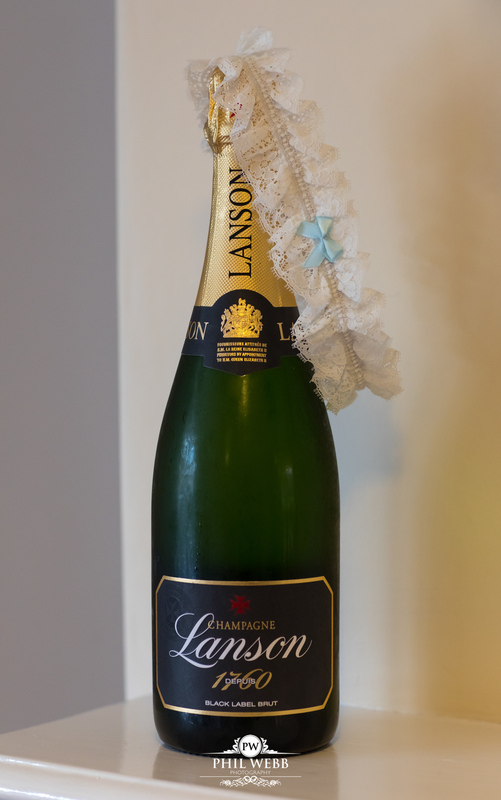 Big congratulations to Claire & Jonathan. 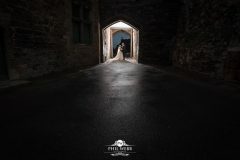 And it may amuse you to learn that as I was leaving in the pitch dark, it stopped raining!